Disclosure: This page may contain affiliate links. Clicking through for additional information or to make a purchase may result in a small commission. Thank you. Arnhem Land in the NT, courtesy of Jones Around the World. Australia is a big country, with lots to see and do. You’d need months or years to see the place properly and in reality, many visitors only get a few weeks (if they’re lucky!). 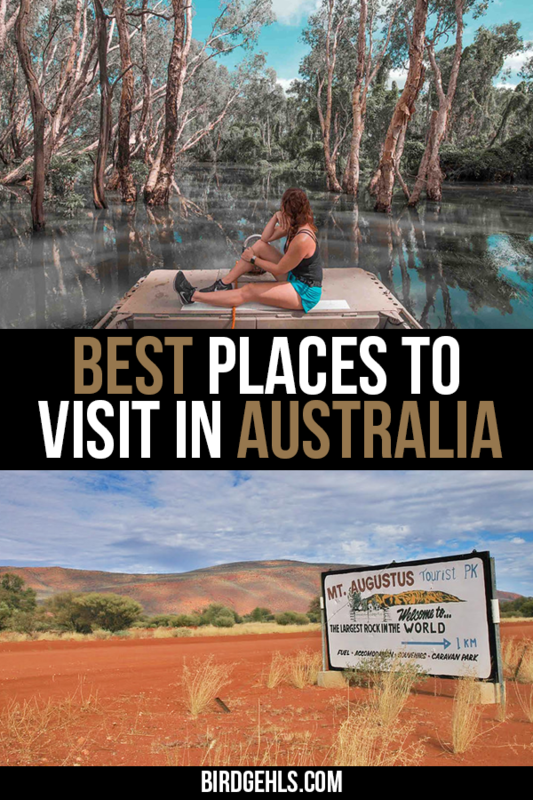 I’ve reached out to other travel blogger’s to ask them what they reckon are the best holiday destinations in Australia and here are their answers. This post demonstrates just how much there is to see in Oz – aside from its more famous sights. You could spend a long time exploring this country and feel like you’ve barely scratched the surface of all it has to offer and its history – both natural and manmade. A big country requires a big list. Here are some of the best places to visit in Australia, by state or territory. Be sure to bookmark this page for future reference! Victoria is Australia’s second most densely populated state. It’s where to city of Melbourne is located and is home to many different national parks. 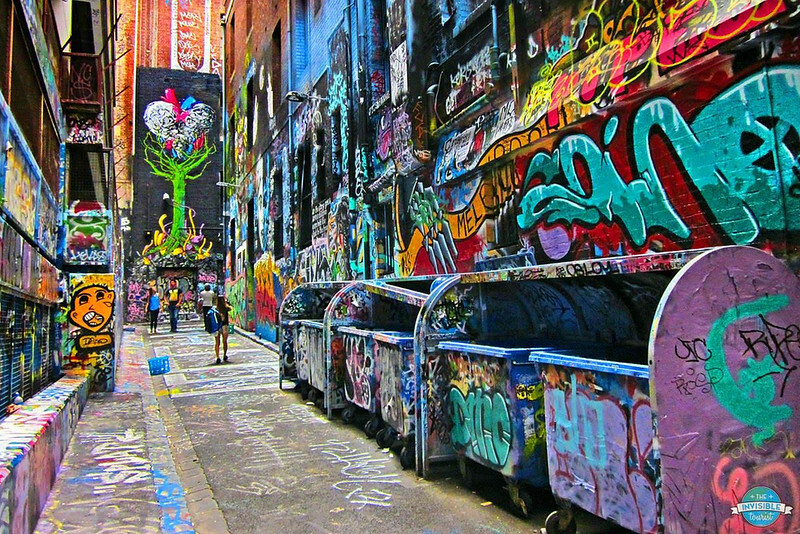 Melbourne has a different kind of beauty to most places on this list. There’s a friendly rivalry between the residents of Sydney and Melbourne as to which is the “best” Australian city. While this is a pretty subjective topic, as a Sydneysider I have to give credit where it’s due and say Melbourne wins. It’s truly a must-see Australian destination. Melbourne proudly wears the label of Australia’s culture capital; it’s easy to see why. The entire CBD is a delight with something to suit all tastes, whether you love shopping up a storm, appreciating the foodie culture, admiring street art and galleries or getting involved in international sporting events. At the risk of sounding cliché, Melbourne really does have it all! I especially love how old meets new in a surprisingly harmonious way. From the early 20th century charm of Flinders Street Station to the geometric modernity of Federation Square and Eureka Tower. Melbourne has managed to carve out a special identity over the decades by embracing modern architecture, while complimenting the old simultaneously. Although there are tonnes of things to see and do within the city’s borders, you may wish to escape the busy city and head to the beaches in Melbourne’s south. The St Kilda Promenade and Luna Park are popular with visitors, but the colourful Brighton Bathing Boxes steal the show. Even though I’ve visited Melbourne a dozen times, I’ll never tire of the buzzing vibe that floats around the city. I always leave feeling inspired and wanting to return again. If you’re planning a trip to Australia, learn how to be an “invisible tourist” by creating a Melbourne itinerary ahead of time to make the most of your visit! Editor’s note: On the flip side, here are some reasons why Sydney is a better city than Melbourne. It’s an argument that won’t ever get resolved. And here are some tips on where to stay in Melbourne and unique things to do in the city. There’s a lot to see and do at the Geelong Waterfront. Most people think of Uluru or the Great Barrier Reef as must-see Australian destinations. And they are. But we recommend visitors also head to the Geelong Waterfront for a fun-filled Australian experience. 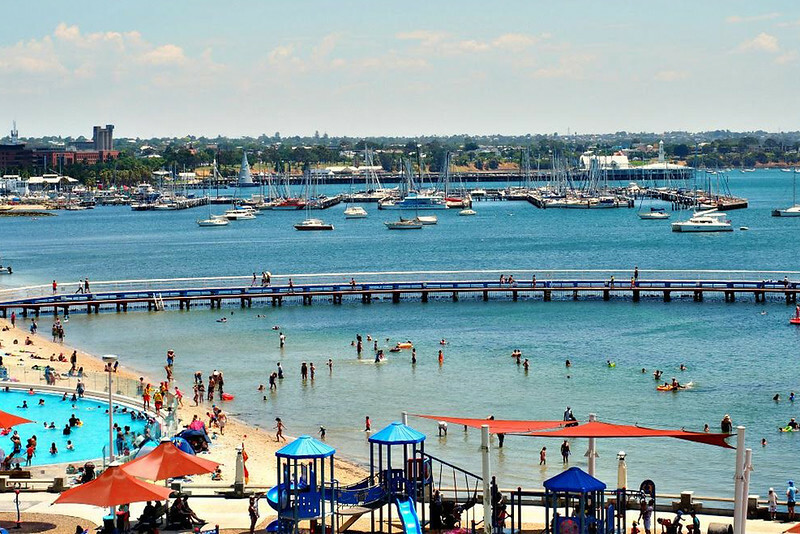 Geelong is Victoria’s second largest city and it boasts the country’s only north-facing waterfront – which means lots of sunshine! Starting life as an industrial port, the Waterfront has become a vibrant gathering place for locals and tourists alike. Visitors come to enjoy restaurants and cafes, markets and festivals and spectacular views across the bay all the way to Melbourne. The area known as Eastern Beach is covered with beautifully manicured lawn that’s ideal for picnics and barbecues. Take a dip in the enclosed swimming area on a hot summer’s day. Surrounded by a fabulous art deco promenade it features floating islands and a dive tower. A highlight of the Waterfront and a must-see for any visitor to Geelong are the famous Baywalk Bollards. These quirky pieces of art were made using timber piles from an old city pier. A favourite amongst selfie-taking tourists they depict unique characters from the city’s past. Take a stroll along the foreshore and see how many you can find. Bringing some carnival fun to the area are the beautifully restored Carousel and the Giant Ferris Wheel that lights up the sky at night. With plenty to appeal to the most discerning traveller, the Geelong Waterfront is must see on your Australian vacation. ‘The Prom’ as it’s known, is around a three hour drive from Melbourne. Wilson’s Promontory National Park is one of the secret gems of Victoria and a must-see destination for outdoor lovers. Affectionately known by the locals as “The Prom”, it is the southernmost tip of the Australian mainland and is famous for its beautiful beaches, isolated rocky landscapes and huge range of enjoyable hiking trails. There are several beaches easily accessible from the main area at Tidal River including Squeaky Beach (yes, the sand really does squeak!) and Norman Beach. For families, the 2.5km Prom wildlife walk is a great trail to go take and search for emus, wombats, koalas and kangaroos! For hikers the 4km trail from Darby River to Tongue Point via Fairy Cove is a gorgeous walk along the headland with hidden beaches to enjoy. For incredible views the 7km return hike to the summit of Mt Oberon is essential. Located just 200km from Melbourne, there is camping available on site at Tidal River, although due to its popularity amongst locals and tourists alike, spots need to be booked a long way in advance. Accommodation is available in the surrounding towns including Fish Creek and Inverloch. Wilson’s Prom is a beautiful place to spend a few days when exploring Australia. Adnate’s silo mural at Sheep Hills. Although these amazing public art murals are popping up across the country, Victoria is home to the original six painted silos, which make up the Silo Art Trail. 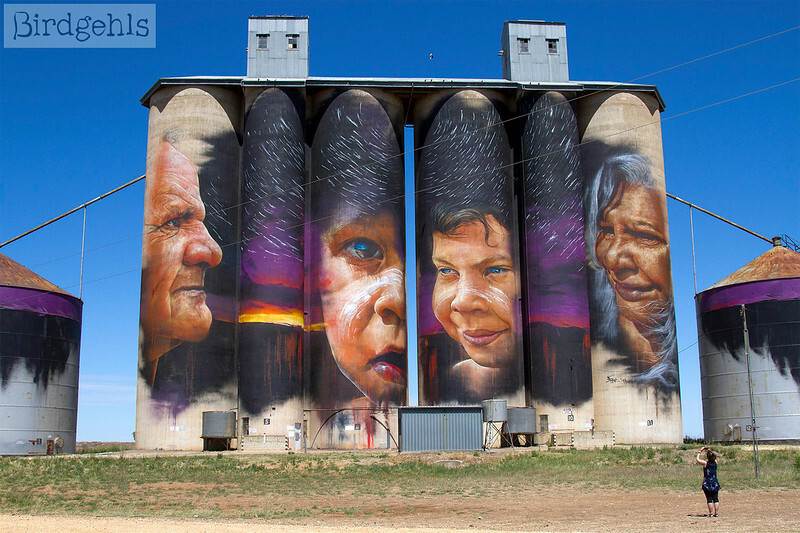 These works have been painted across disused grain silos by both Australian and international artists and are hoped to bring tourists to little known country towns, across the state. It is working, with travellers making the often long trek out to see these murals, spreading the tourist dollars where they’re most needed. There are currently two silo art trails in the state of Victoria. One is in the north-west of the state, the most remote being around a five hour drive from Melbourne. It takes around two hours to see all six, if you do them quickly. Another five are north of the city, not far from Victoria’s alpine region and the King Valley. If you hustled, you could see all five in a day with a return to Melbourne, but it would be a really long day. Either way, I recommend carving out some time to see the murals for themselves, whether that be one or as many as you can manage. Read more about the original silo art trail here. This park is popular amongst Melburnians for bush walking. Cathedral Range is my favourite place in Victoria. It isn’t on the radar of most interstate or international visitors, but Melburnians love it. A 7-kilometre long ridge of upturned rock that in parts takes on a ‘razorback’ formation, it’s a spectacular sight from near or far. There’s something about the place that can’t be described, though. I feel at home there. I guess that explains why I proposed to my now wife there in 2015. The park is especially popular for its scenic and well-equipped campgrounds – Neds Gully and Cooks Mill – but it’s also perfect for those who want to do more than just sit around a campfire. Whether you’re into fishing, hiking, or even rock climbing, Cathedral Range State Park will not disappoint. Hiking is my adventure of choice, and there are trails for all ages and abilities. My favourite is the Cathedral Range Southern Circuit, which offers the choice of two ascents to Razorback Ridge, either via a cave and almost rock climb, or a slightly easier exposed rock scramble. Both are doable without any safety equipment but there’s no doubt they feel dangerous. Neither are suitable for someone not looking to confront their fear of heights, that’s for sure. The Northern Circuit is still a tough day hike but without the fear of falling to your death. It’s also just as beautiful, so may be better suited for some. These two hikes can be joined to make an overnight hike, camping at The Farmyard walk-in campsite. The Great Ocean Road is a popular road trip to take in southern Australia. 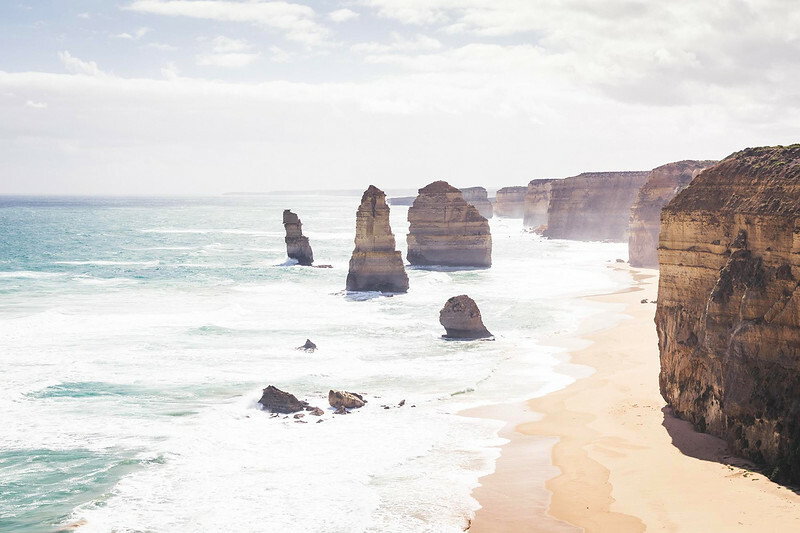 The Great Ocean Road is Australia’s most famous coast road and one of the most visited tourist attractions in the country – and for good reason! The road itself is located along the southern coast of Victoria, winding along the rugged coastline formed through millennia of waves crashing against the land. And the results of which are some of the most amazing natural rock formations and sinkholes in the world. From the 12 Apostles to the Gibson Steps, Loch Ard Gorge to The Grotto, there are no shortage of natural wonders for visitors to see. Check out this list of 100+ other things to do in Australia. New South Wales is the country’s oldest state, best known for being where Sydney is located. There is a lot to do and see outside of the state’s capital – cute small towns, gorgeous national parks and a really lovely coastline to explore. Sydney Harbour is home to some of Australia’s most famous icons, the Harbour Bridge and Opera House, and is a must for anyone visiting the country. Built in 1932, Sydney Harbour Bridge was an incredible feat of engineering at the time, and the scale of this structure that connects the north shore and the city still blows you away today. 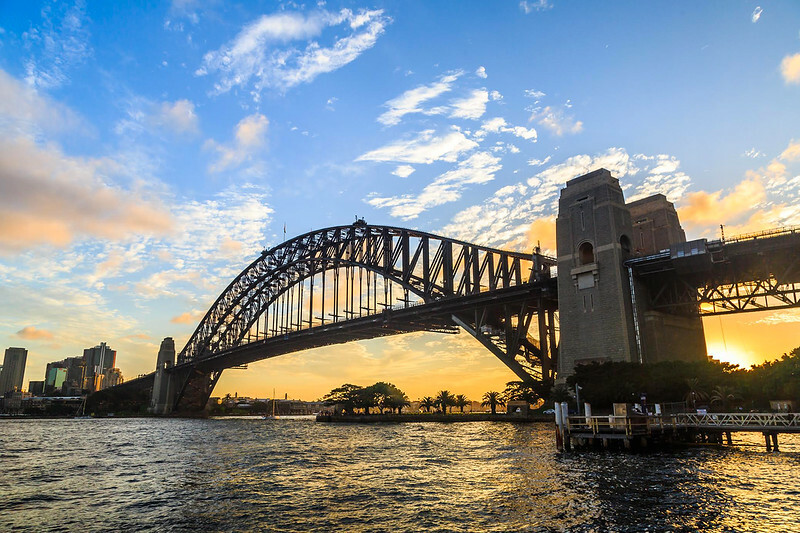 There are several ways to experience the Harbour Bridge from climbing it, to walking across it or admiring it from one of the many lookouts around the city. Our top recommend would be to walk across it which takes you from Circular Quay to Kirribilli, one of Sydney’s most beautiful neighbourhoods. If you time it right Jeffrey Street Wharf in Kirribilli is a fantastic spot to watch the sunset. Just across the water from the Harbour Bridge is another of Sydney’s most celebrated buildings, the Opera House. There are few buildings in the world that are more recognisable. You can take in the Opera House with a guided tour, a concert, show, or simply admire its beauty from the Overseas Passenger Terminal in Circular Quay or the Botanic Gardens (head to Mrs MacQuarie’s Chair for one of the most incredible harbour views in the city). It’s almost mandatory to have a drink at the Opera Bar which has fabulous views of both the Opera House and Harbour Bridge. The best way to get around the harbour is by ferry. The views on all routes are stunning but a favourite is from Darling Harbour to Circular Quay which takes you right under the bridge itself. 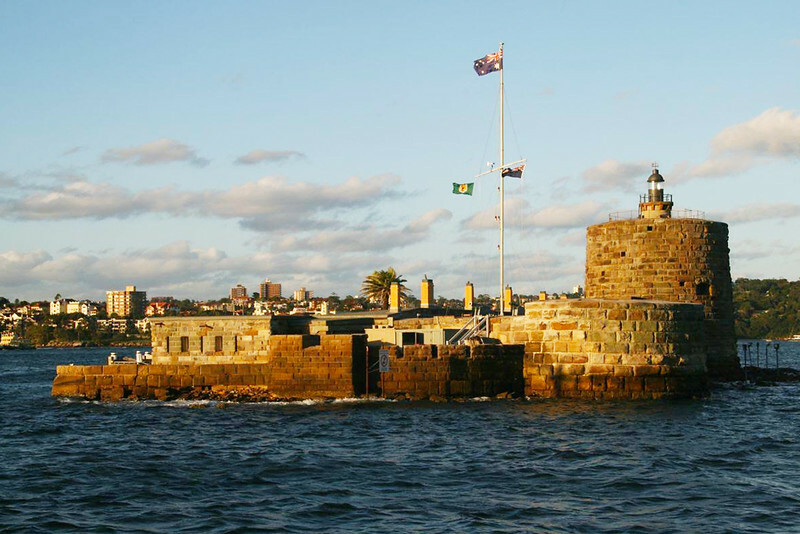 Fort Denison is an island that can be found in Sydney Harbour. Fort Denison is one of Sydney’s Harbour Islands and can be seen directly in front of the Sydney Opera House, about 1 kilometre out to sea. The small island that the fort sits on today was originally covered in a much thicker layer of sandstone, but most of this was quarried and used to build Circular Quay. The island was used as a maximum-security prison for convicts during the early colonial days, and the bodies of criminals sentenced to death were sometimes left hanging here in chains long after they had been executed. In the 1850s, a fort was built here to guard against attacks by the Russian navy during the Crimean War. The fort now covers the island so completely that the bedrock can hardly be seen at all. The most distinctive feature of the fort is the round Martello tower, originally built as a gun room for cannons and later repurposed as a lighthouse, which is still in use. Fort Denison is now part of the national parks system and home to more than 100 birds. To visit the museum, catch the ferry from Wharf 6 at Circular Quay, which departs every 45 minutes. The return ferry ticket costs $17 and includes the museum entrance fee. A full tour of the fort and the tower is also offered by the Australia national park service. This must be booked in advance and costs $27, which includes the return ferry trip. Editor’s note: Fort Denison is home to a restaurant, which is currently closed but will hopefully re-open in late 2019. Wendy has a guide to being vegan in Australia, which is highly possible, particularly in the bigger cities. The ocean baths of Australia’s most famous beach. If you ever find yourself in Sydney, Australia, you’ll want to be sure to stop at Bondi Beach. It is one of Australia’s most famous beaches, and for good reason. There is lots to do around Bondi. First, the white sand beach is a beautiful stop to enjoy with the blue waters. Grab a surf board or boogie board and head out on the waves. 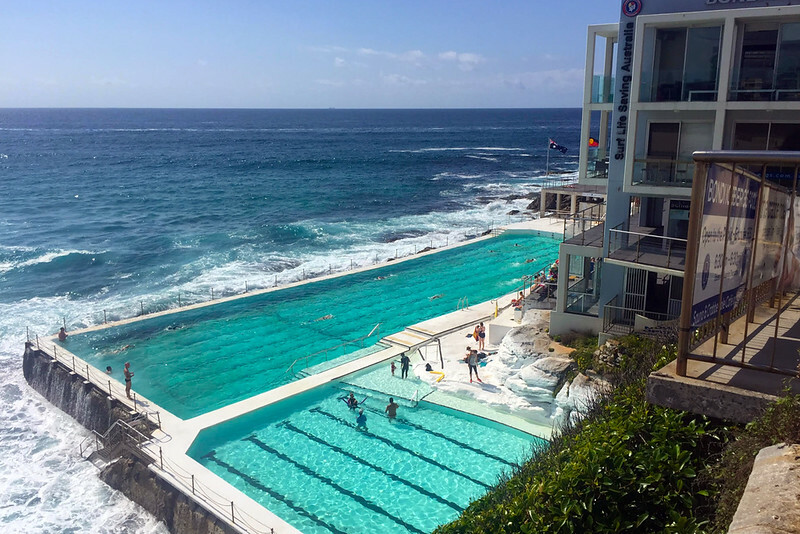 Bondi Beach has a very unique attraction in the the Icebergs ocean pool. It is a pool that is open year-round, and can be enjoyed by everyone. There is lap swimming available in the outside pool, where waves can crash into the pool while you’re swimming to give you more of an ocean swimming feel. Enjoy the artwork all around Bondi at Sculpture by the Sea, the graffiti wall, and their many art exhibits. You can take the Bondi to Coogee Coastal Walk for some beautiful sites and a great hike. There is lots of great food available in Bondi, and we recommend trying a few out. Grab some fish and chips and head to the beach for a picnic. Bondi Beach is more than just a beach, and you can enjoy the whole day there, and still not be able to hit everything. Editor’s note: Click here for some other places in NSW worth visiting besides Sydney. 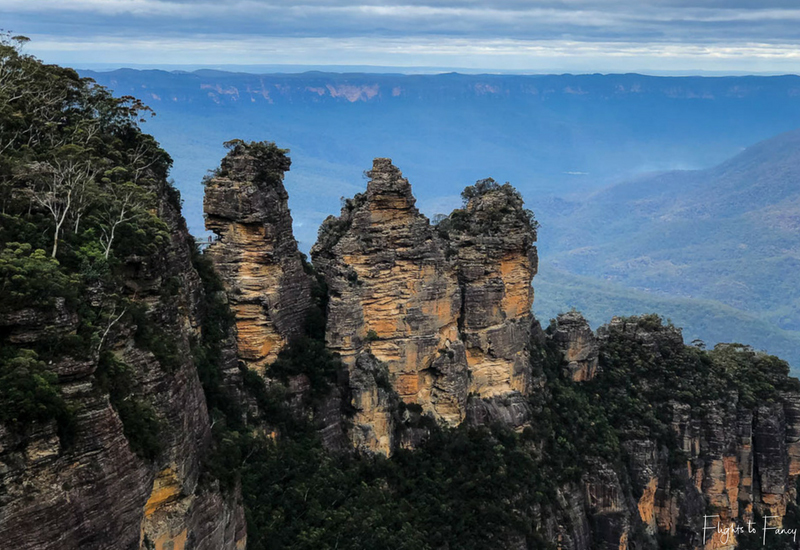 The iconic Three Sisters, which can be found within the Blue Mountains. As a lifelong Sydneysider I always take folks who come to visit me to NSW’s spectacular Blue Mountains. At just over an hour’s drive, the Blue Mountains is an easy day trip from Sydney. If you don’t have access to a car, catch the train on a Sunday where unlimited public transport is just $2.70* with an Opal Card. 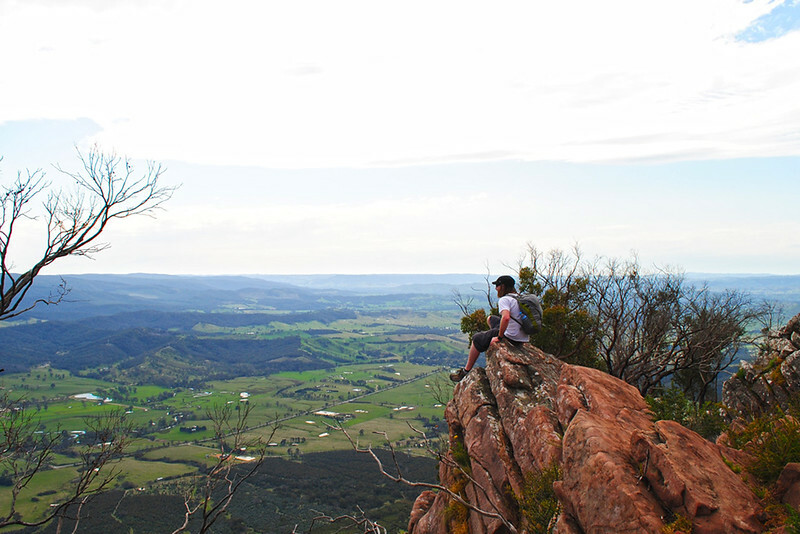 Make your first stop the stunning Jamieson and Wentworth Falls, which both have easily accessible lookouts. If you are feeling more energetic there are several walks in the area that will get you closer to the action. Not far away is Leura Village which is a quaint little town perfect for a lunch stop. Next head to the Blue Mountain’s premier attraction; Scenic World. At Scenic World you can ride the world’s steepest incline railway, admire the view from the cable car or just explore the various walking tracks. From Scenic world either walk or drive to Echo Point for amazing views of The Three Sisters. If this all sounds like too much to do in one day, why not stay a little longer. The Blue Mountains has a wide range of accommodation from budget backpackers to luxury lodges and everything in between. You don’t have to travel far from Sydney to immerse yourself in nature. Royal National Park is a must visit destination when you are in Australia. It is a short train ride out of Sydney. 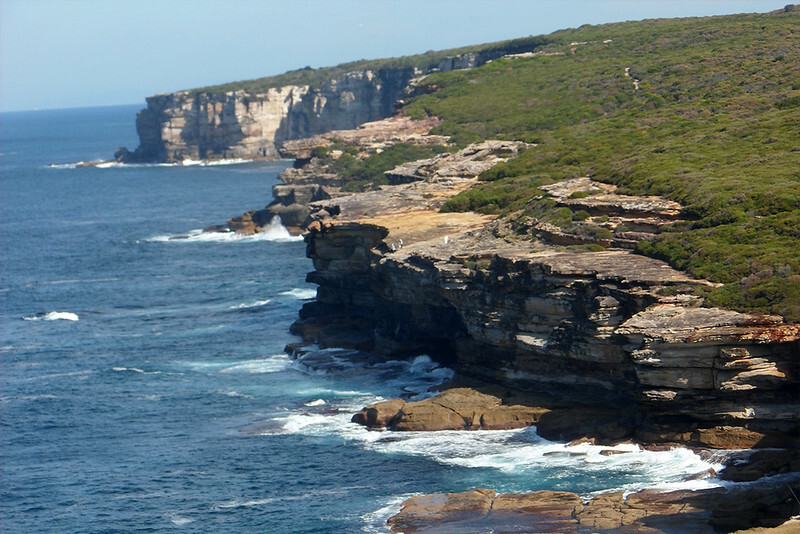 Take a train to Cronulla from Circular Quay station in the city and from Cronulla, catch a ferry to Bundeena. This is where you can start your adventure in Royal National Park. Pick up a free map of the park along the way and choose one of the amazing coastal walk trails to enjoy. Keep the map close, as you might need it to find your way at some points. If possible, pick a trail that takes you to Marley beach in the park. It is a lovely way to enjoy the day. Walk along this beautiful coastal path mesmerised by the deep blue sky and equally blue waters of Tasmanian sea beside the huge sandstone cliffs that hug the waters. It is truly a magical experience that recharges your soul and it is a must do for nature lovers. There is no food or water available inside the park, so carry water and snacks for your breaks. If you start the trek early in the day, you can finish most of the trails and head back before dark. Check the ferry schedule and safety alerts for the park online before you plan the trip. Check out some other must-see Sydney spots here. Looking out over the ocean at Bouddi National Park. When visiting Australia I highly recommend making the trip out from Sydney to the Central Coast. 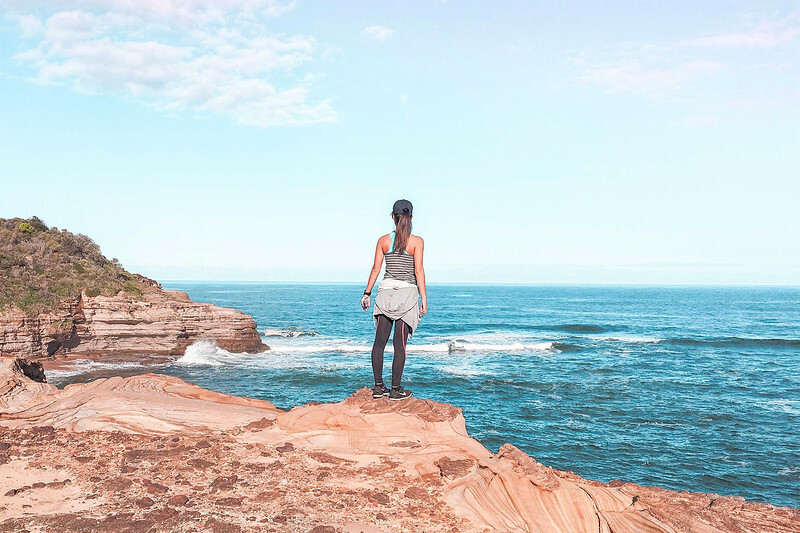 The NSW Central Coast is located about 1.5 hours north of Sydney and is home to amazing beaches, cute cafes and the incredible Bouddi National Park. Located near Killcare, It was one of the first national parks established in the state and covers over 1,532-hectares of national park. A section of the park extends into the Tasman Sea, creating fully protected land, shore and marine habitats. The beautiful Bouddi National Park offers spectacular diverse landscapes including beaches and cliffs through to rainforest and wildlife! The best part is the 8km coastal walk that runs from Putty Beach to MacMasters Beach offering epic views at every turn. The 8k walk is partly boarded making the journey nice and easy, it’s also great as you get a real diverse range of scenery! Pack a picnic lunch and stop at one of the beaches for a well-deserved break, or take a dip at Maitland Bay if the sun is out! If the whole 8km doesn’t appeal to you, you can tackle parts of the walk instead. Editor’s note: If you want to travel a little further up the coast, check out the seaside city of Newcastle or nearby Lake Macquarie. You can find just about every landscape in Queensland, from the red dirt of the outback, to tropical rainforests. It’s home to the most gorgeous beaches in the country and is of course where you can find the Great Barrier Reef. Taking a moment on Fraser Island, the largest sand island in the world. Fraser Island definitely deserves a place on your east coast Australia itinerary. The island is also known as K’gari which means “Paradise” in the local Indigenous Butchulla language. 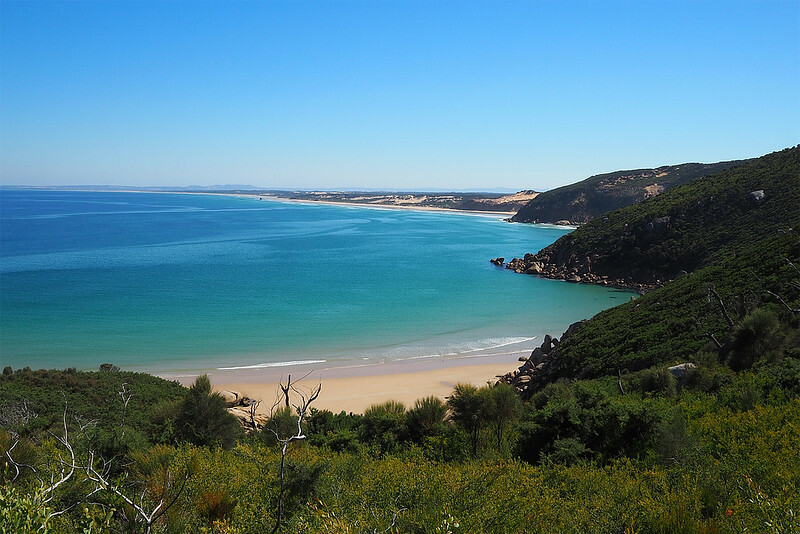 K’gari is a UNESCO world heritage site, filled with serene places such as freshwater Lake Mackenzie, tall rainforests, interesting wildlife, a 75 mile long beach, the historic Maheno Shipwreck, strange Pinnacles, lovely Elli Creek and more. The cherry on top is the scenic flight you can book that flies over the Fraser Island, giving you an awesome view from above. Fraser Island is the biggest sand island in the world! The roads are fundamentally sands, so you have to drive nonstop to keep the momentum and not sink in. Loads of adventure is waiting for you there. 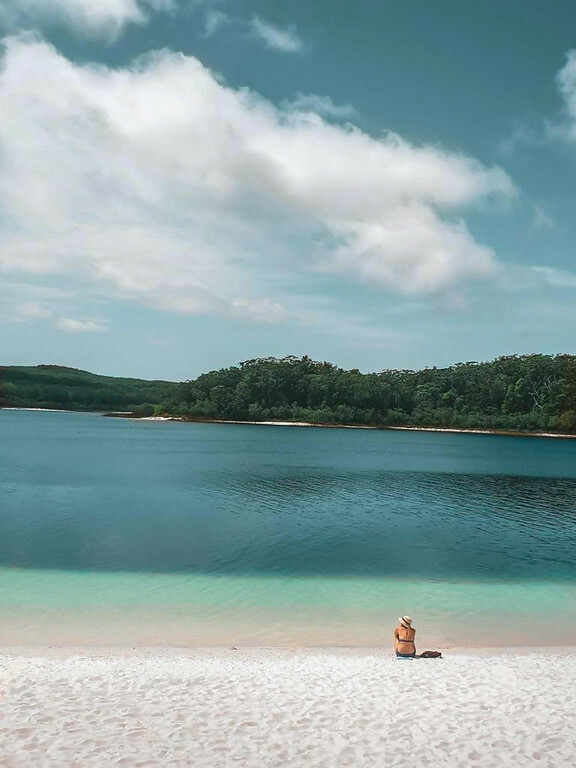 If you want to create an unforgettable memory in Australia, planning your trip to Fraser Island is a must. The most common and easiest way to get to Fraser Island is to arrive in Hervey Bay first (around a three hour drive from Brisbane) then transfer to a boat. You can also camp overnight on the island, enjoy stunning places during the day and star gaze at night (with no light pollution around the island, you will probably see the Milky way too!). And as you leave, don’t forget to take your trash with you! Looking out across the Daintree Rainforest. If you’re looking for all the must see destinations in Australia, you can’t miss the Daintree Rainforest from your Australia bucket list. The Daintree Rainforest is a 1-hour drive away from Cairns and you can visit it on an organised day trip from Cairns. With its 1200km squared its the largest rainforest in Australia and the oldest rainforest in the world. 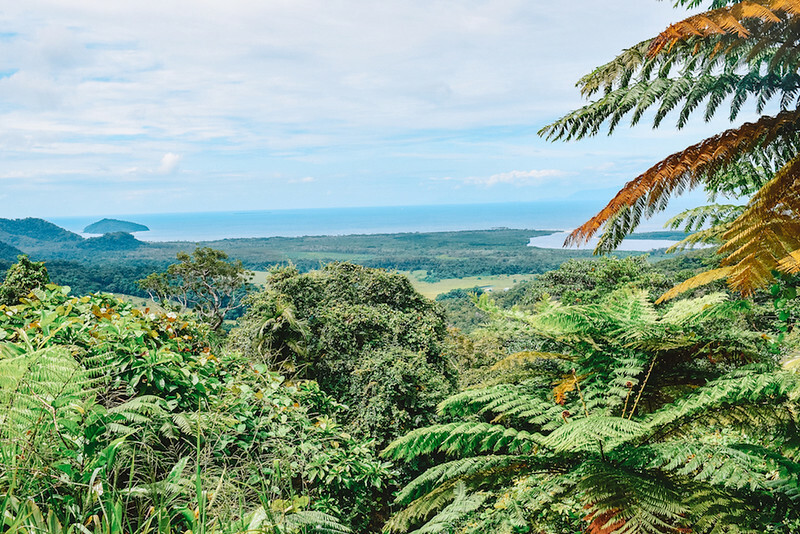 If that isn’t enough of a reason in itself for you to visit the Daintree Rainforest you should go also because it’s one of the richest natural environments in the world, where you will be able to see crocodiles, wallabies, huge spiders and even a cassowary if you’re lucky. It’s fun to do an organised tour since your guide will teach you about local flora and fauna, the impact human influence is having on the Daintree Rainforest and how we can reduce it. There’s a Whitsunday Island to suit every type of traveller. If you’re looking to visit one of Australia’s most idyllic spots, the Whitsunday Islands are somewhere that you should put on your list. The islands are located off the coast of Queensland in the middle of the Great Barrier Reef, and you can reach them either by air or boat. For day trips it’s best to stay at Airlie Beach where numerous tour companies offer day tours around the islands. You can read more about the best trips in this area by clicking here. 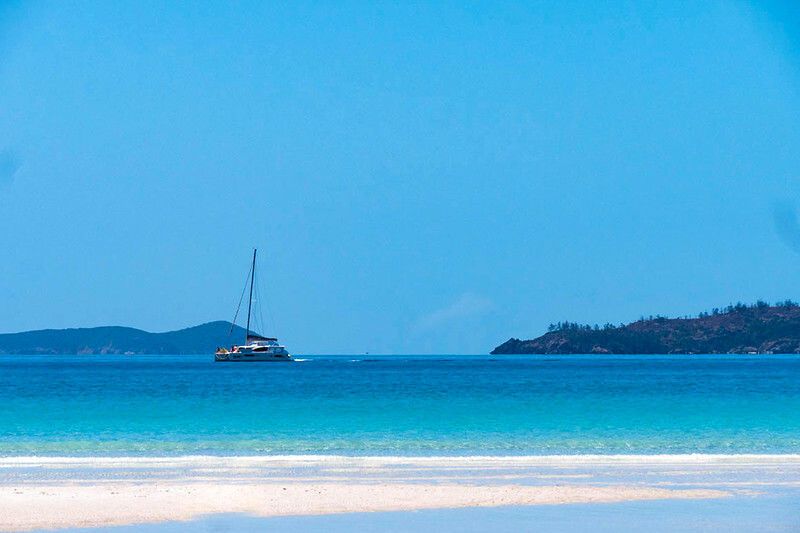 One of the most popular day trips is to Whitehaven Beach. This beach is famed for its glorious white silica sand and turquoise water. It’s often listed amongst the worlds most beautiful beaches. It’s one of my favourite parts of the world, and its beauty is hard to describe. The view from the hill lookout over the beach is just breathtaking. If you want to stay on one of the Islands Hamilton Island is a popular choice. It has its own airport and boats depart to there regularly from Airlie Beach. Islanders use golf buggies to get around, and snorkelling is one of the main activities there. If you’re looking for a family resort, Daydream Island would be best. This island resort is currently being refurbished and will be officially reopened in April 2019. Activities on the island include snorkelling and diving, water-sports and an open air cinema. The island’s man-made outdoor aquarium is popular with guests. They also have a fabulous spa and a range of health and beauty treatments. If you prefer a little more exclusivity, Hayman Island is the place for you. Here you can enjoy fine dining and luxurious accommodation. For somewhere quiet, Long Island is a unique island that is much less frequented than some of its neighbours. It has some of the best walking trails of all the islands. If you can sail, it’s possible to hire a yacht from Airlie Beach and spend a few days cruising around these islands. There are lots of excellent diving spots in the area and during whaling season you’re likely to see the humpback whales on their migration up north. Moreton Island is one of Queensland’s sand islands. Moreton Island near Brisbane, Australia is the third largest sand island in the world. White sand beaches and a whole selection of activities available on this sandy heaven makes it a fantastic spot for a relaxing break. The island is mostly well-known for its shipwrecks called Tangalooma Wrecks. You will notice them poking out from the blue water literally metres away from the coast. When it comes to exploring these sunken ships, you have two options. First, you can snorkel yourself or book a snorkelling boat tour or alternatively you can scuba dive it. Either of those options work equally well – it really depends on whether you want to spend the extra money for scuba diving or not. Other activities include sunbathing on the beach and swimming, kayaking, feeding dolphins, 4WD island safari tour or even getting a helicopter ride. The standard one day tours only allow visitors to stay for a day (morning arrival and later afternoon departure) in which case you won’t have time to do much. spend a night or two in Tangalooma Island Resort. Moreton Island is such a great place to forget the busy city life and enjoy a relaxed tropical island experience. 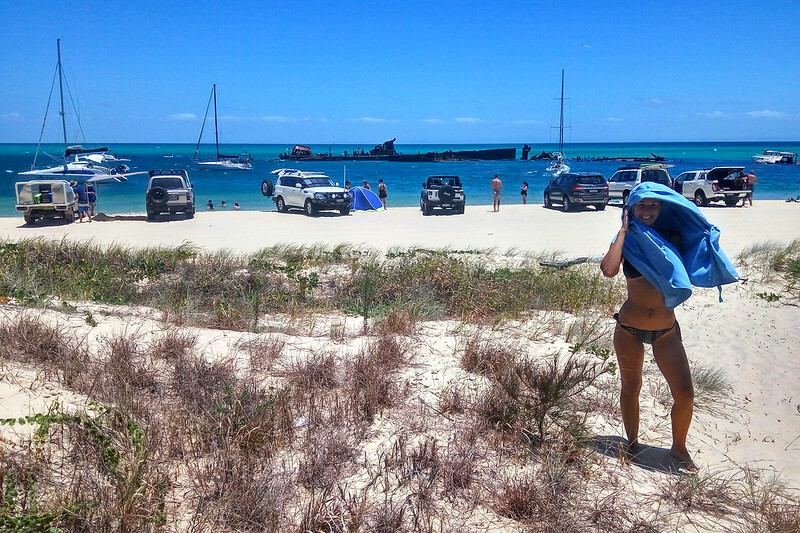 Give Moreton Island a try and I can guarantee you will not want to leave! Find out more about the Moreton Island tours here. The ACT is oft neglected by travellers (and Australian natives!) but it shouldn’t be. Not only is it home to the capital city of Oz, there’s some beautiful nature to be found in this tiny territory. If you’re going to visit Canberra for any reason, it should be for the food. Canberra is Australia’s true underrated gem. As the country’s parliamentary epicenter, it is often overlooked compared to other cities, but it shouldn’t be. Housing both city and country – it is the perfect mixture of both. 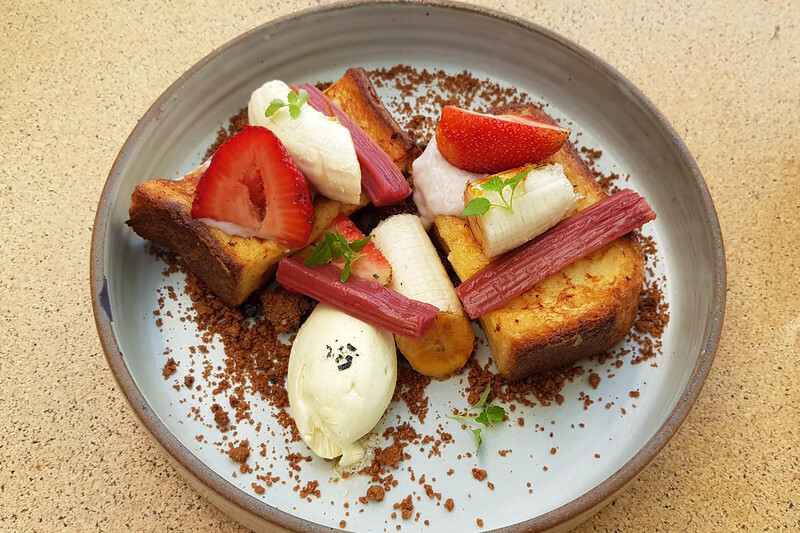 Canberra is a foodie haven. Delicious food options are abound here, housing iconic eateries like Brodburger, as well as sustainable initiatives which can be found on the water at the Kingston Foreshore, like ‘Local Press Café’, or the CBD located ‘The Cupping Room’. No matter what you want, there are endless opportunities to please your tastebuds. It is a mecca for all things art and culture. With a never ending (it often seems) array of national art galleries and museums. The portrait gallery and national galleries in particular are worth checking out. The Museum of Australian Democracy, The National Library and the Museum of Australian History are all popular choices too. And if all of that’s not enough, there are the epic views, whether it be the ones from the Canberra Arborteum, what is left of the Stromlo Observatory (following the 2011 bushfires) or the 360 views from the Telstra Tower. Or maybe just the views of Lake Burley Griffin, as you take a wander round it. Canberra is truly a city unlike any other. Step one foot inside it and you’ll see why. 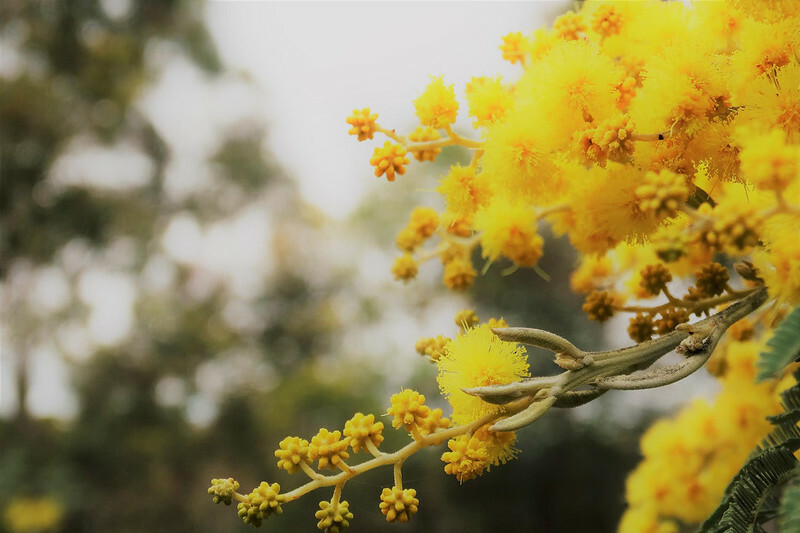 See Australian flora and fauna at Tidbinbilla Nature Reserve. Tidbinbilla Nature Reserve is one of Canberra’s best kept secrets. This reserve all about experiencing the best Australia has to offer when it comes to nature. If you want to see koalas, kangaroos, emus, possums, wallabies, a range of different birds and even the elusive platypus than you really must come out to Tidbinbilla. As you walk along one of the many hiking tracks than you do have the opportunity to spot one of Australia’s native species. If hiking isn’t exactly your thing, then you do have a few other options. It could just be a scenic stroll through the wetlands, take a guided tour with a Ranger, bring your bike and go for a cycle, go orienteering or have a BBQ with the family. Tidbinbilla really is for everyone. Mobility-impaired visitors can hire the TrailRider, an all terrain wheelchair. You will need two or three people to guide the chair but it really does give everyone the opportunity to experience nature. For those who are hiking, there are 22 trails that range from easy to hard. The trail range from 15 minutes right up to 19 kilometres but you can get all of this information from the Visitors Centre. Tidbinbilla is one of my absolute favourite places to see Australian nature at its finest. The NT is where you’ll find Australia at its rawest – harsh temperatures, deadly creatures and a famous monolith. Sunset in the far north of the country. Australia is a big country. In particular, Darwin and the “Top End”, one of the most northern parts of Australia, is closer to Asia than the main cities in Australia, just a couple of hours flight from Bali. 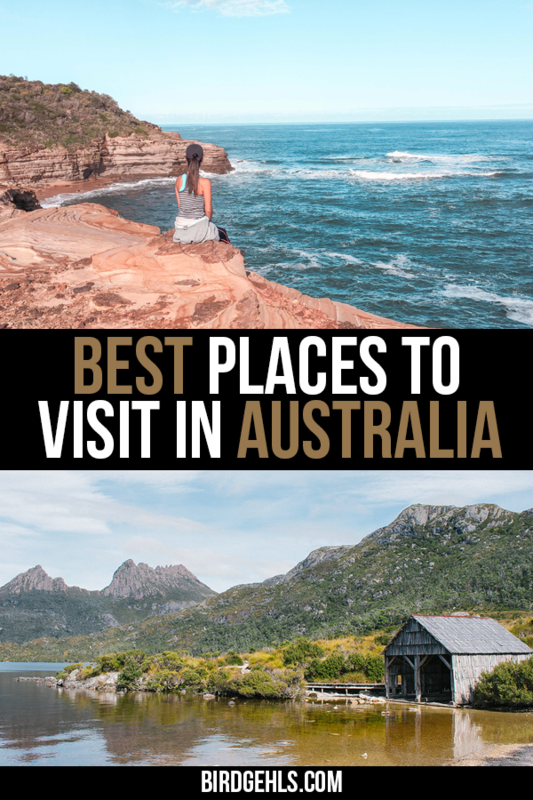 It’s an easy part of the country to overlook when planning a trip, but it’s one of Australia’s must-see destinations to visit. For starters, much of the Top End is contained in the massive Kakadu National Park. This UNESCO World Heritage area has been listed for both its impressive natural wonders, from the extensive wetlands to the sandstone escarpment and its waterfalls, and for its cultural heritage. 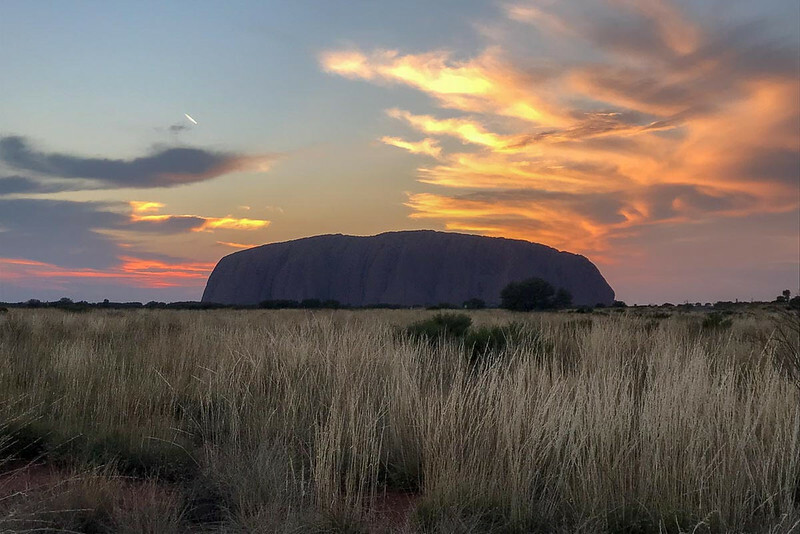 The local Aboriginal inhabitants have a deep connection with the environment and there’s many spectacular rock art sites open to the public, not to mention local tours. The region is best explored on a road trip. Pick up a campervan or 4WD in Darwin, then head out to Kakadu. If you organise a permit, perhaps continue on into the Aboriginal reserve of Arnhem Land, one of the best preserved wilderness areas in Australia. 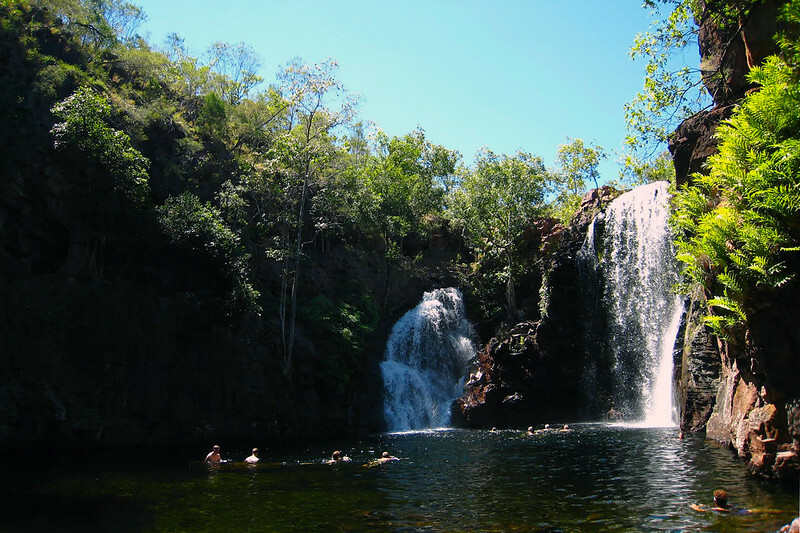 Alternatively, head to the gorgeous waterfalls of Litchfield National Park, perfect for a dip in the hot climate, or take a cruise on Nitmiluk (Katherine) Gorge. See more on taking a road trip to Darwin here. The Rock changes colour, depending on the light at the time. Uluru is known world wide as one of Australia’s premier tourist attractions. Sure, it’s just a big rock in the middle of nowhere that takes forever to get to and therefore tends to be expensive to visit, but let me tell you, it’s worth every cent. Here in the middle of Australia you can see a side to the country that connects you to the ancient culture of the Aboriginal people. Uluru is one of their most sacred sites, and the stories and legends woven around it give it a truely timeless feel. Watching sunrise or sunset (or both!) over Uluru is a must. The changing colours of the rock is simply breathtaking. One thing not to do is to climb Uluru. After October 2019 this will not be possible, but before then, think carefully about the wishes of the Aboriginal people who request visitors do not climb. Climbing Uluru is highly offensive to their culture, and it is also doing permanent damage to the surface of the rock. While visiting Uluru, it’s also important to visit the nearby King’s Canyon and Kata Tjuta, both incredible natural attractions in themselves (you can see most of the sights around Uluru in three days). Both show different features of this incredibly vast land. An Aboriginal guide can tell you some of the dreamtime stories that will really bring out the magic of all these places. You’re pretty much guaranteed to see crocs in this part of the land. There’s a famous saying in the Northern Territory that goes – “you haven’t been down under until you’ve Outback”. And now that I’ve been there for myself, I would completely agree with that statement! Australia is a massive country, and you could spend years travelling around and still find hidden gems. You may not have heard of it, but I would recommend looking into an Arnhem Land Wildlife Safari. 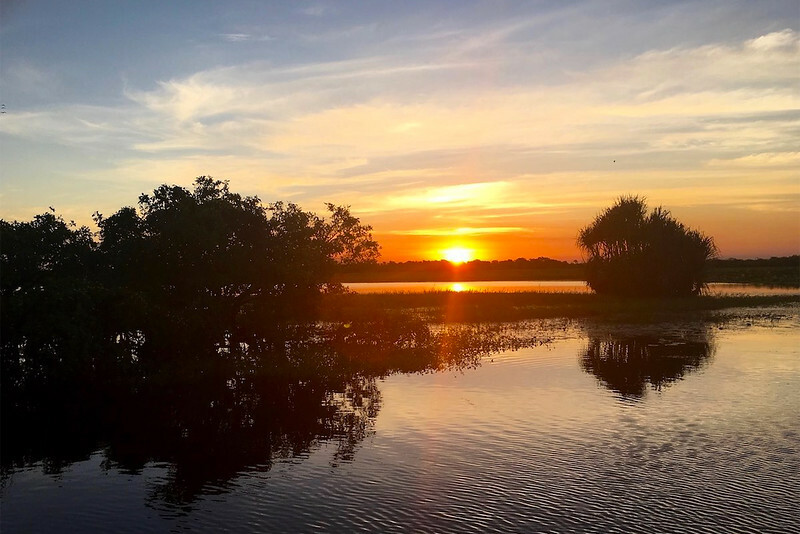 Complete with boat rides through mangroves, crocodile spotting, ancient Aboriginal rock art, and starry night skies – I can guarantee it’ll be a trip you never forget! Your trip will most likely begin with a scenic flight over the Kakadu National Park (which is an adventure all on its own), and you’ll land on a dirt landing strip in the middle of Arnhem Land. You’ll be picked up in a 4-WD Drive Jeep, and taken on a quick drive to your basic yet luxurious glamping accommodation. There’s nothing around you except nature, and the feeling is truly magical. You’ll spend your days adventuring around the gorgeous scenic area with very few others, and I promise it’ll be unlike any other experience you’ve had in the country. I was honestly shocked I had never heard of Arnhem Land before, but it’s now one of my favourite places in the country. While it may be a bit more expensive, it’s worth every penny! 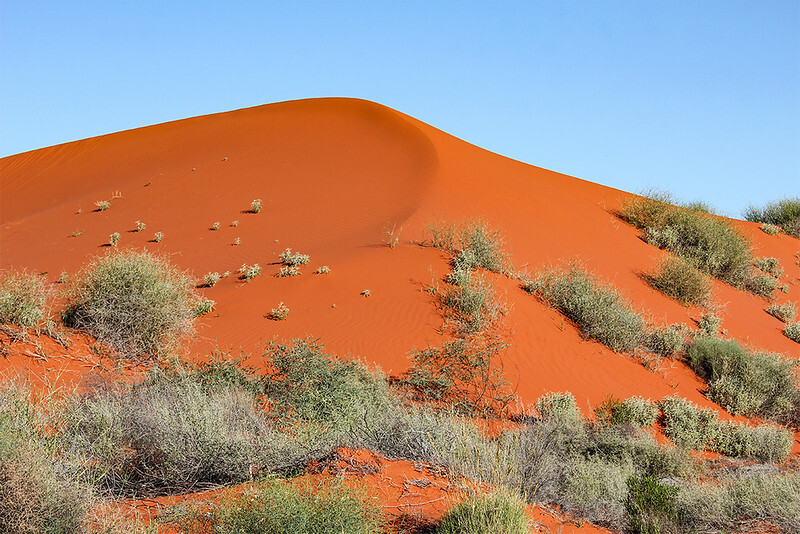 The pretty unreal red sands of The Simpson Desert. Lying smack-dab in the middle of Australia, Simpson Desert is a vast and dramatic landscape of red sandy plains and towering sand dunes. It is home to the world’s longest sand dunes, some of which reach up to 40 meters in height. With the daytime temperatures reaching 50°C and frequent sand storms, it is not the land for the faint-hearted. Yet the desert is full of life, from the hardy people who run enormous sheep and cattle ranches to the equally hardy wildlife species that developed some unique adaptations for life in the extreme conditions. A good place to get a taste of life in the Simpson Desert is the Old Andado station that lies on the edge of the desert, about 330 km south-east of Alice Springs. The station is an iconic remote Australian homestead that is no longer inhabited and can be visited as a kind of museum of Australian Outback life at the start of the last century. In the years before the electricity, running water, phones, or even glass windows, the station ran cattle, sheep and horses. Back then, the main method of communication with the outside world was via the camel-driven mail caravan that came about once a month. You can stay at the very basic dorm rooms or camp amidst the towering red sand dunes inside the home paddock. Once you explored the homestead, head out to check out some of the spectacular Australian desert wildlife like dingoes, hopping mice and burrowing desert frogs. You will need a 4WD to reach and explore Old Andado. And make sure to bring all your food and petrol with you. There are no shops within easy reach. Editor’s note: The Simpson Desert technically covers three states (NT, QLD and SA), but its placement in this section seems best fitting. Edith Falls, in the NT. Nitmiluk National Park, formerly named Katherine Gorge National Park, sits 240 km south of Darwin in the Northern Territory. The park is famous for its Katherine Gorge, and one of the favourite things to do is taking a boat cruise along the gorge. A sunrise or sunset cruise is sure to be a fantastic experience. More adventurous travellers can rent canoes, to navigate to a couple of the 13 gorges and even camp there. Located about 60 km north of Katherine on the west side of the park, Edith Falls are the other top attraction of Nitmiluk National Park. A series of cascading waterfalls and pools on the Edith River, Leiliyn as the Falls are also called in Aboriginal Jawoyn language, are between 30 to 40 feet (9 to 12 meters) high. The natural pools created by the falls are perfect for a refreshing swim in the summertime, especially after a hike. Indeed, a couple of hiking trails are available around the pools. The short but challenging 3-km Leliyn Trail takes you on a rocky loop. The 9-km back and return hike to Sweetwater Pool will lead to a nice pool, as the name said. For long-distance trekkers, the 62-km Jatbula Trail starts in Nitmiluk National Park Visitor Centre and ends at the Edith Falls. If hiking is not your thing or you want to experience the park differently, take a helicopter ride and admire the gorges of Nitmiluk National Park from high above. Edith Falls is open all year round but might be closed from November to April. 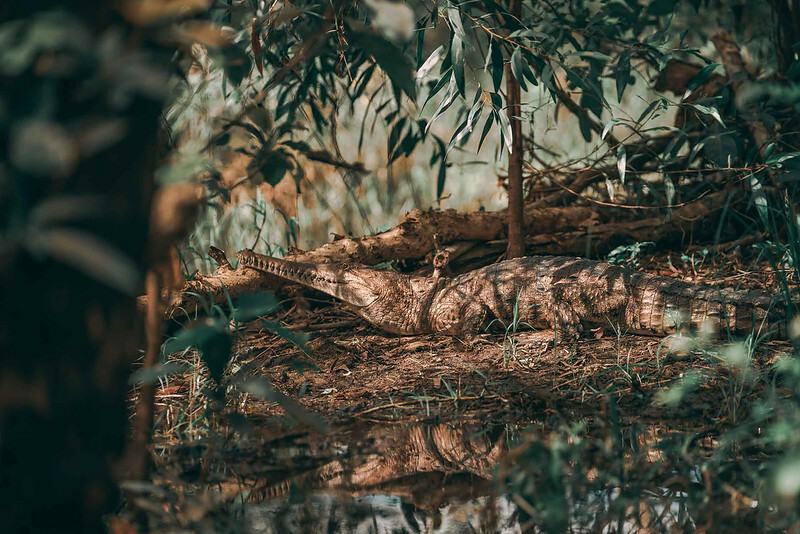 Indeed, saltwater crocodiles roam the river during the wet season, whereas they are absent during the dry season from April to October. Freshwater crocodiles can also be present, but they usually are of no danger to humans. 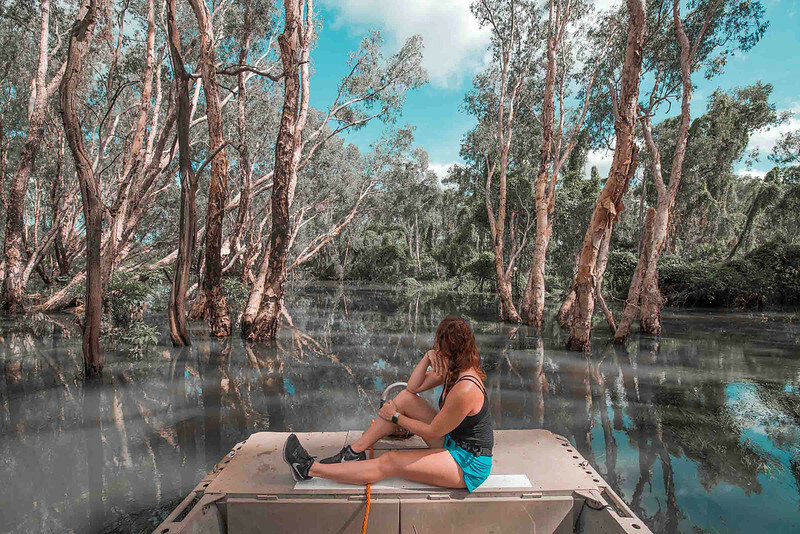 Nitmiluk National Park can be visited as a day trip as part of a tour from Darwin to Kakadu National Park about two hours and 130 km away, or as a longer stay for soaking in the scenery. Campground sites and picnic on the grounds are available around the area. South Australia is a very underrated destination in Australia. Not only does it contain the very cool city of Adelaide, it has some truly spectacular (and also quite odd) landscapes and sights. Think sweeping valleys, plenty of options for wildlife spotting, a dramatic coastline and entire towns that have escaped underground, in order to survive the harsh, summer sun. 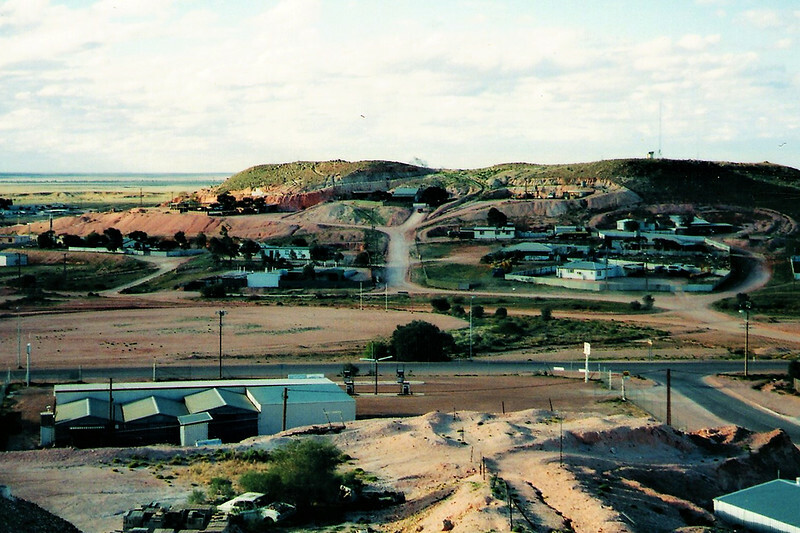 The city of Coober Pedy, much of which is underground! Coober Pedy’s ‘Big Winch’ shows exactly what this small, remote South Australian outback town out in the desert is all about. It’s the Opal capital of the world and the Big Winch is part of the difficult process of getting Australia’s national gemstone to the surface. Sure, it’s easy to ‘find’ an opal souvenir in the city without trekking 850 km (530 miles) north-west of Adelaide to discover how it’s done. But prospecting for a piece of opal while experiencing how the locals live in the driest state of the driest continent on earth will be a whole lot more memorable. And with a local population including 45 nationalities, the chances of meeting a fellow citizen somewhere in town are better than average. Summer temperatures regularly top 40°C (104°F), so a lot of the Coober Pedy action happens underground where temperatures are constant – and MUCH cooler. Head below the surface and you’ll find opal mines, accommodation, churches, opal showrooms – and even the world’s only underground campground. Above ground, explore the town, take a sunset tour to the nearby ‘Breakaways’ rock formation, go ‘noodling’ for your own piece of opal in the public prospecting area, or play a round of golf on the only course in the world with reciprocal rights at the Royal and Ancient Golf Club of St Andrews! And in the (sadly likely) event you don’t find anything worth keeping, at least you’ll know your Coober Pedy opal purchases are the real deal. Kangaroo Island in South Australia is the perfect destination for those looking to delve into nature. An easy two-hour drive from Adelaide and a quick ferry hop brings visitors to a wildlife paradise. All throughout the Island various animals can be found, especially koalas, kangaroos, echidnas, possums, and many more. While touring around, be sure to pull off at the various trail-heads on the main roads and look up into the trees, to spot some of Australia’s unique birdlife. The ocean-side Kangaroo Island Wilderness Trail at Flinders Chase National Park offers visitors incredible hiking and camping opportunities, as well as star-gazing at its finest and seal and whale watching from just off the coast. The trail is perfect for those interested in seeing more of the coast – visit the ranger station before jetting out to get the latest in trail conditions. Travel down to the Remarkable Rocks and Admirals Arch for stunning sunset photos and to experience more of Kangaroo Island’s natural beauty. Even the drive down the road to these one-of-a-kind rock formations is worth the trip to the west coast of the Island. Nearby Seal Bay allows visitors the opportunity to spot seals basking in the sun on the beaches, and Kingscote offers numerous artisan food and wine opportunities, sourced locally. Home to the most isolated city in the country, Australia’s biggest state has a lot to see – from vineyards to beautiful coastlines, cute small towns and a heck tonne of desert. 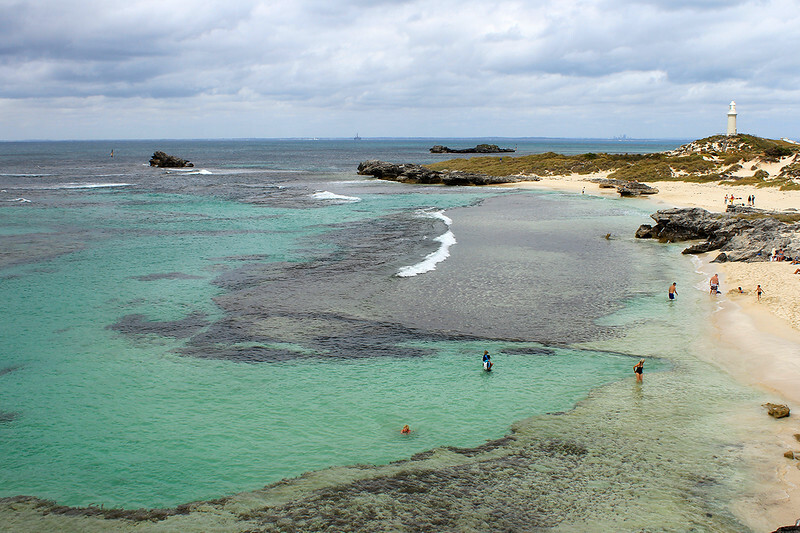 The Basin, one of the many beaches on Rotto. It’s fair to say that Rottnest Island has all you’d be looking for in an Australian destination. From pristine white beaches to the iconic wildlife, it’s a small slice of paradise sitting just off the coast of Perth, Western Australia. The most popular activity for a visit to Rottnest Island is self-guided bike tour around the island. Stopping at various coves, beaches, and bays you get the chance to cool off in the crystal clear waters, see some beautiful marine life, and spot the shipwrecks that are dotted along the coastline! Along your way not only will you want to stop for the scenery, but there’s a popular little marsupial that truly captures your heart. The quokka is native to Rottnest Island, and dubbed the happiest animal in the world it’s easy to see why it holds such a prestigious title! You’ll your new furry friends literally everywhere on Rotto, curiously hopping about sniffing out their next meal. As quokkas are so docile with the cutest chubby cheeks around, they’re always happy to pose for a photo or two and give visitors the chance for a coveted quokka selfie! Besides the nature side of Rottnest Island, you can also take a ride up to the historical attraction of Oliver Hill Battery for 360 views of the island and learn about the island’s place in military history. With so much to see and do on Rottnest Island, you definitely can’t miss it on your trip! 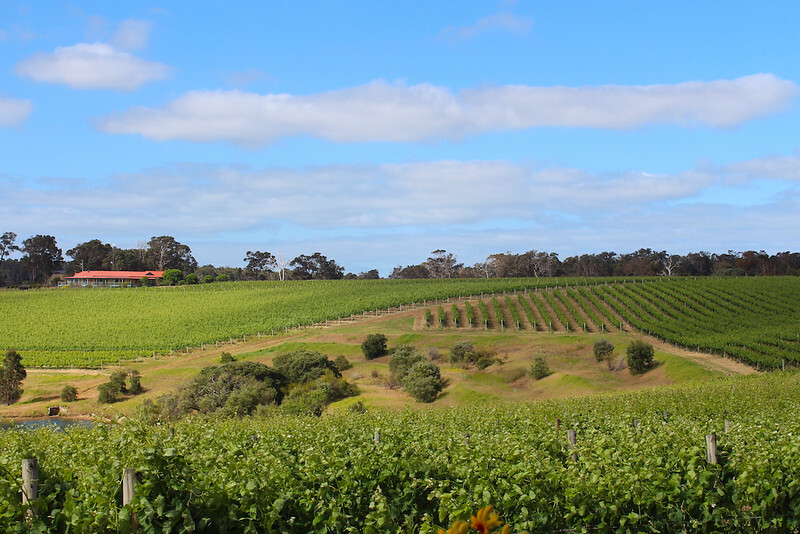 Margaret River is one of Australia’s best-known wine scenes. Margaret River in Western Australia is not only a beautiful part of the country, but is also one of the best quality wine regions in Australia. Although a small region, Margaret River specialises in premium wine, with its 200+ boutique wineries accounting for 20% of Australia’s premium wine production. So you know you are looking at a lot of high quality wine here. With a similar climate to Bordeaux in France, Margaret River wineries particularly focus on Cabernet Sauvignon, Sauvignon Blanc Semillon and of course its famous Chardonnays. Although well known for its small boutique wineries, some of the better-known labels you may have heard of include Cape Mentelle, Voyager, Vasse Felix and Leeuwin Estate. Most of the wineries have friendly cellar doors open to the public for wine tasting and many of them also have amazing restaurants for lunch too. Although Margaret River has made its name through wine, beyond the wineries the area is beautiful and there is plenty to do aside from wine tasting. With over 135km of coastline, it has some of the most beautiful beaches in the world, and is also famous as a surf destination, with over 50 surf breaks. There is also a network of show caves to explore, the spectacular Cape to Cape Walk track and an abundance of outdoor activities. It’s not just a playground for adults. Read more about what to do in Margaret River with kids here. Checking out the sights in this region of WA. A few years ago I went on a solo road trip adventure from Perth to Albany in South Western Australia and fell in love with this region. Albany has many striking natural attractions that stretch over a vast area. While it will take you 45-60 minutes to drive from the Eastern end of Two People Bay to the western side of the Torrndirrup National Park, you may start your exploration in the city by visiting the the King George Sound. It’s a mighty harbour with many small inlets and bays that makes it very photogenic. The natural bridge and the Gap are two of the highlights with remarkable rock formations. Both were re-opened to the public in 2016 with a see-through platform placed 40 metres about the sea. There is a small fee to visit this area well worth the money. Albany also offers beautiful coastal hiking trails at the Possession Point Trail from where you can enjoy a stunning view of the King George Sound. 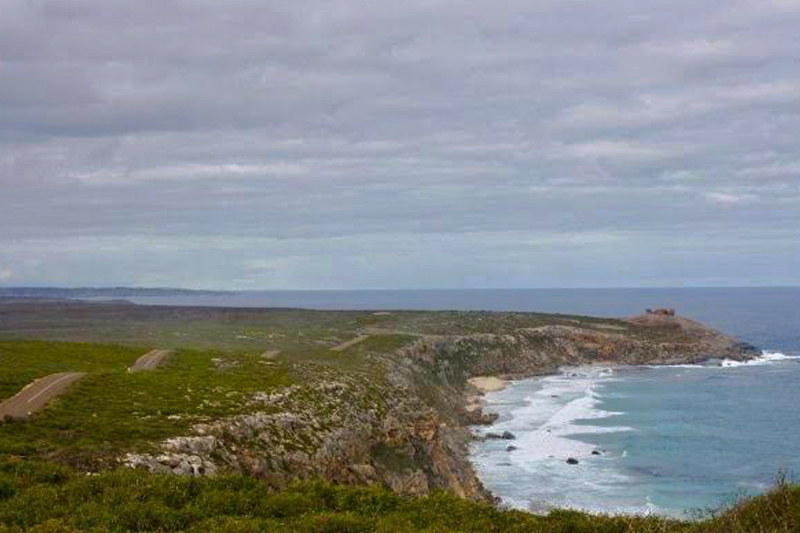 All around the Flinders Peninsula on the western side, there are many walking tracks and lookouts to enjoy short to long walks and descend to white-sandy beaches like Salmon Holes, a famous beach for fishing salmons. A week is what I recommend to do justice to this region and visit all the beautiful places in Albany, Western Australia. 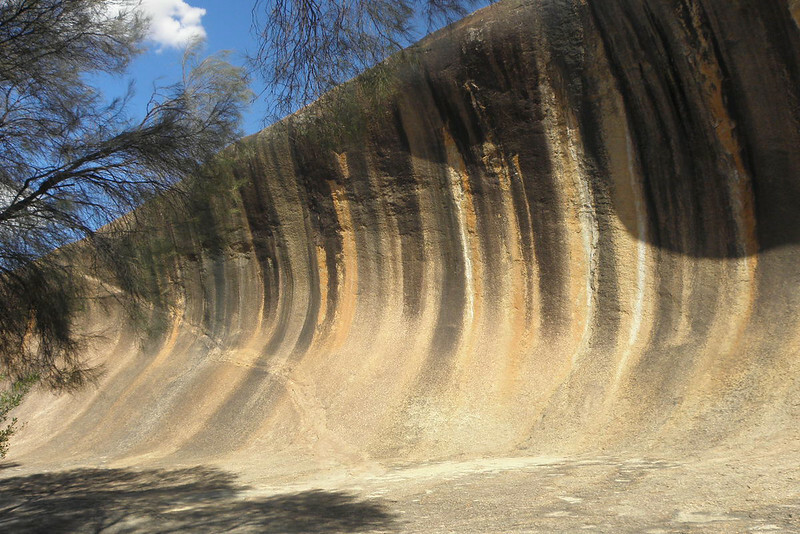 Hang ten on the wave rock in WA. The Wave Rock in Western Australia is so out of the way, that not many people visit it. It is 350 km from Perth, so it will require at least 4 hours driving one way. It is possible to do it as a day trip from Perth. There are a few attractions along the way that are worth a stop. York is a historic town, which is interesting for a sightseeing walk and to stretch the legs to take a break from driving. The empty endless roads that seemingly lead into nothing are also quite interesting for people who are used to driving in bigger cities. Once you arrive you can find free parking at Hippo’s Yawn. This is an interesting rock formation as well, which resembles to a hippo yawning. The highlight if the trip is definitely the Wave Rock. It is fun to take photos with the 15 m rock, pretending you are riding a big wave. Expect to take lots of photos! If you still have the time you could also visit Mulka’s Cave. It is 18 kilometres north of Wave Rock. In the cave, you will see some Indigenous rock art in the form of handprints, which is a really special experience to see. Editor’s note: If you’re looking for more road trip ideas in WA, why not go visit the Principality of Hutt River? A beautiful place to while away some hours. If you are a nature lover and like a bit of adventure in your travels, then Coral Bay in Western Australia should be a MUST on your list of places to see in Australia! 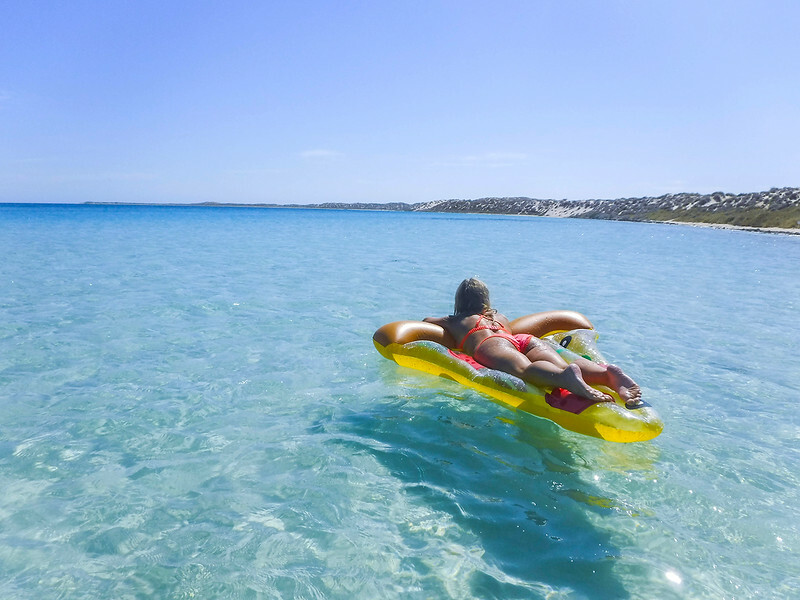 About 11,000 km north of Perth you will find a little slice of paradise, otherwise known as Coral Bay. Coral Bay offers pristine white sand beaches, a reef about 15 steps off shore and some majestic wildlife. If you are an earlier riser, head down to the bay to watch dolphins play around before all the boats get started for the day. It is truly peaceful to watch them play around on the calm water against the pink and yellow sunrise. During the day while snorkeling just off shore it is common to see stingrays, sea turtle and of course plenty of colourful fish. At some point during your stay, you should head out on a 4X4 tour or rent one to take out on your own. This is the perfect way to explore the surrounding sand dunes and gives you the opportunity to discover Oyster Bridge or Five Fingers Reef for some amazing snorkelling. Exploring the sand dunes offers some epic views of the area that are unforgettable! Coral Bay should definitely not be missed on your travels through Australia. It offers something for any kind of traveler and is truly a little slice of paradise! Mount Augustus is Australia’s lesser-known big(ger than Uluru) rock. Mount Augustus is one of the biggest natural wonders of Australia. Ironically, it’s also one of its least known. Tucked away in West Australia’s Gascoyne region, Mount Augustus is a massive mass of rock that is more than two times bigger than the size of Uluru. The rock mass covers 4.7 hectares, rises up to 1054 metres above sea level and takes 49 kilometres to drive around. For the local Wadjari community, this rock is known as Burringurrah and features prominently in Dreamtime stories. Aboriginal engravings can be seen at various points in the rock face. Mount Augustus is remote and there’s no easy way to get there. By road, Mount Augustus National Park is reached via Gasgoyne Junction to the west or from Tom Price if travelling from the north. Both ways involve gravel roads with road conditions depending on the time of the year. Once there, things to do centre around Mount Augustus National Park and of course the rock. There’s a 54 km loop trail around Mount Augustus which has entry points to the best sights. There are several walking trail options including the challenging 12 km summit trail which takes hikers all the way to the top of Mount Augustus. Two picturesque rock pools along the Lyons River which make for nice picnic areas. 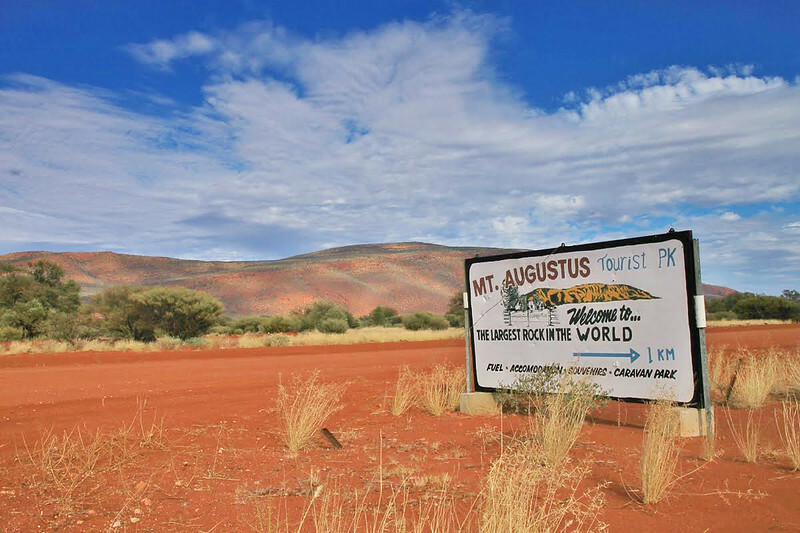 Accommodation is at the Mount Augustus Outback Resort which has caravan sites and dongas. Self-sufficiency is the key when visiting Mount Augustus. Bring plenty of supplies, water and extra fuel. With the freshest air in the world and some truly gorgeous countryside, Tasmania is one of the most beautiful places in Australia, that you can visit. The gardens at Port Arthur. Port Arthur is a place that so many Australians remember from both past and present horrific tales. Port Arthur is a place that pulls at your heartstrings, it was a tough, hard place that bought so much heartache to people long ago and unfortunately, more recently as well. Port Arthur was originally a convict prison settlement in Tasmania Australia in the 1800’s where criminals were sent to see out their terms. Recently it is also known to be the place of Australia’s only mass shooting in 1996. Originally the huge building that dominates the site was a granary and flour mill before being converted into a barracks to house more convicts. The ruins dominate the site when you first walk through the entrance and out onto the field in front of it. The Port Arthur historic site is nestled in a beautiful little cove that looks stunning in pictures and it must have been such a foreboding site sailing into the tiny cove not knowing what was in store for you here. The sun shines down on you, you feel warm when it is on you but the wind once it comes is like ice through even the thickest clothing. While some of the buildings are in ruins including the Penitentiary, Law Courts, Guard Tower and the Church there are also restored houses around the site that allows you to step back in time, to see what life would have been like for both the inmates and the workers that also lived there. There is so much you can learn about the past times and how cruel they were n the inmates but there is also a beautiful memorial garden in honour of the people who lost their lives on the site in 1996 with the ruins of the Broad Arrow Cafe. It is a solemn place and it seems that no sound follows you as you walk through the hedge to the other side. You can get a guided tour from Hobart that will take you to Port Arthur and back or you can drive yourself. Free walking tours of the site are conducted throughout the day where you are taken around to some of the more significant buildings and given a brief history of what happened there. There are some very popular ghost tours that run at night as well. During your visit, you are free to wander and for some entry tickets, you can also do a cruise to the Isle of the Dead. This is a small island just out of the little cove where convicts and other people from the settlement were buried. There are cafes on site so food and drinks are easy to purchase. If you are visiting in the winter you will definitely need some warm clothes and possibly a rain jacket. So much has happened at this site over the many years. It is a place of reflection, a place to learn things about or history and why some changes were made. We thought our trip there was invaluable to showing our daughters about Australia’s past. Buy your entry ticket to Port Arthur here! 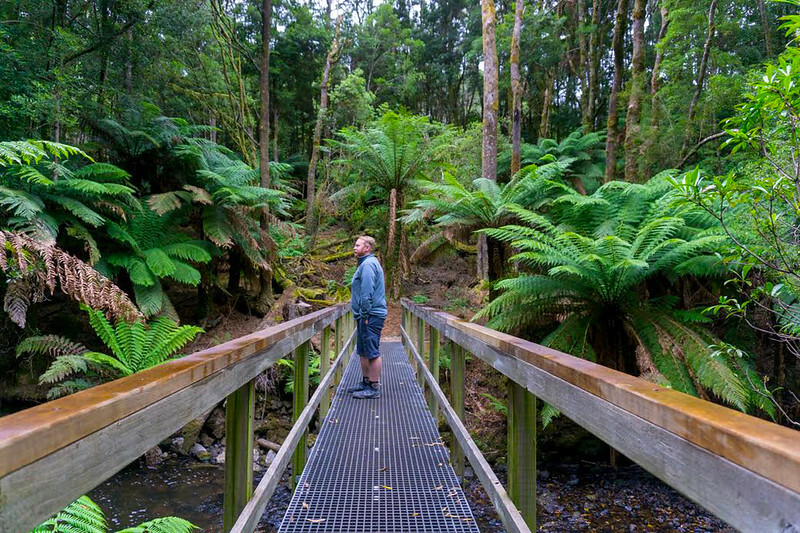 The lush greens of Tassie’s ancient rainforest. Did you know Australia is home to the world’s second largest temperate rainforest? Yeah I didn’t either until recently. You can find it in the Tarkine region of Tasmania, tucked away in the nearly empty North West corner of the state. It’s full of big old growth gum trees and ferns that grow over 4m tall! 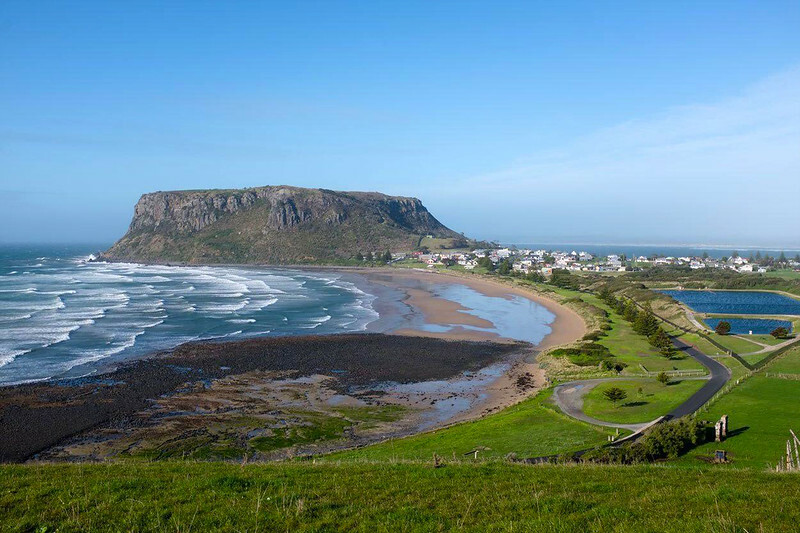 It’s also a really important place for the aboriginal Tarkiner people of Tasmania since it has lots of rock carvings, shell middens and other cultural sites. The ecosystem is so old that it dates back to the age of the Gondwana supercontinent 180 million years ago. So that means visiting the Tarkine is a bit like going back in time! There’s a great 200km loop road trip called the Tarkine Drive and I think that’s the best way to see the region. Along the way there are lots of places to stop to go for a hike, check out the views or camp. My favourite walk in the area was the short track at Julius River. It only takes about 30 minutes to hike through staggeringly huge ferns and huge old growth trees along the banks of a winding river. Everything was so blindingly green! Lower Crackpot is Tasmania’s tiniest town. In the north of Tasmania not far from Launceston, is Tasmazia – the biggest maze in the southern hemisphere. 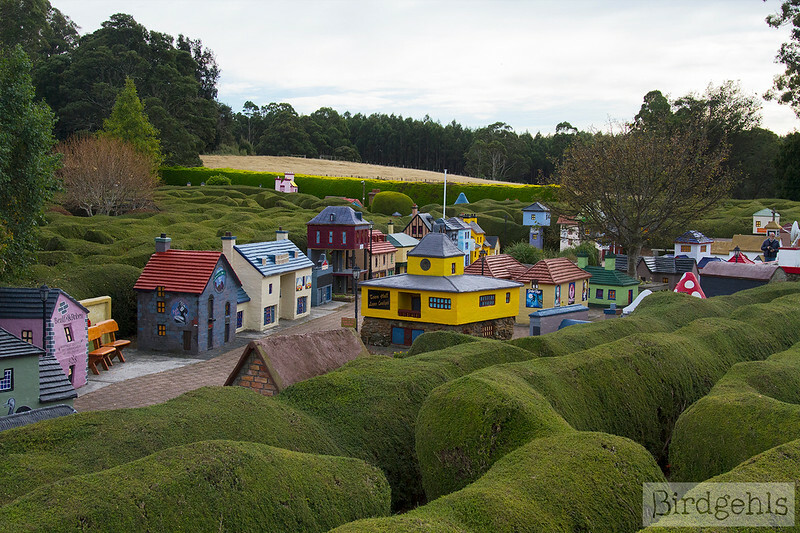 Navigate through the maze and you’ll find Lower Crackpot – Tasmania’s tiniest town. The buildings here are built 1/5th to scale and feature many cultural references to Australia, such as the Channel 7 news station, the AFL House and a building emblazoned with the flag of our Indigenous people. In all, there are eight mazes in Tasmazia – along with the Great Maze there’s a replica of the Hampton Court Maze in the UK, Hexagonal Maze, Confusion Maze, the Yellow Brick Road Maze (built for kids), the Balance Maze, the Cage (which leads you to a monument for the famous British plumber Thomas Crapper) and the Irish Maze. Outside the mazes, are the Embassy Gardens, featuring structures dedicated to many different countries around the world. It’s a great place to explore with children, but also worth checking out if you’re a big kid, yourself. Read more about visiting Tasmazia and the town of Lower Crackpot. 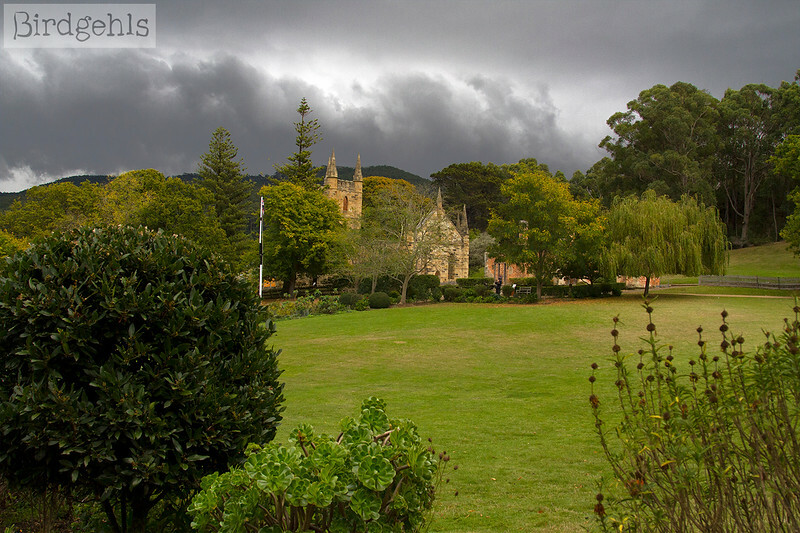 Teetering over the Bass Strait, Stanley is a beautifully preserved colonial town on Tasmania’s north coast. With more than a passing resemblance to a film set, Stanley’s colourful quaint cottages and historic Church Street evoke memories of a different era. Stanley’s picturesque streets are completely dwarfed by the huge stump of a dormant volcano known as The Nut that towers over the town. The flat top of The Nut can be seen for miles around, and a short chairlift ride whisks you to the very top (or an incredibly steep hike if you visit out of season). 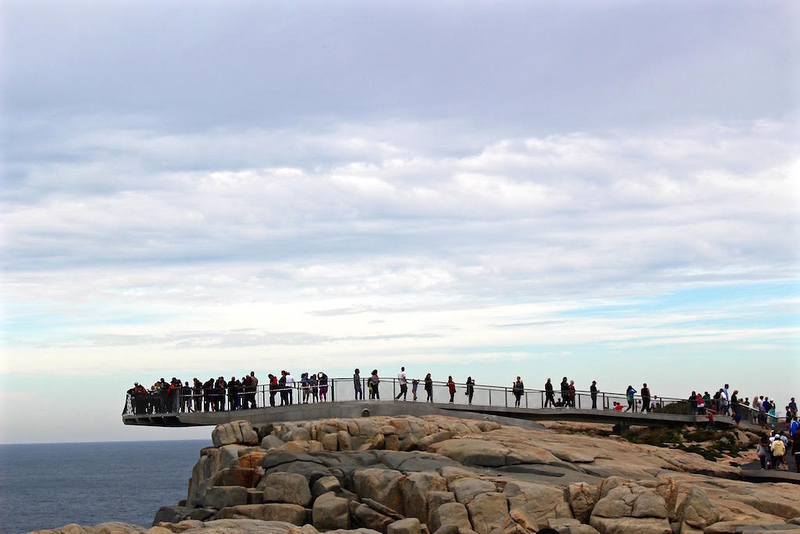 The views from the top of The Nut are sensational, whether looking over the nearby bays and across the Bass Strait or back across Stanley and the green fields of northern Tasmania. Keep your eyes and ears peeled for the wildlife that lives on the top of the Nut. Wallabies wander across the trails and echidnas and rabbits burrow amongst the Nut’s thick patchwork of shrubs. In winter months, you might be able to spot whales out in the Bass Strait. Humpback and southern right whales regularly pass Stanley during their migration north to breed in warmer waters each winter. Stanley’s most famous animals are its penguins, who are often seen (and heard) returning to shore at night. Stanley’s little penguins make quite the racket as they waddle back to their burrows at dusk. There’s a dedicated penguin viewing platform underneath The Nut just next to Godfrey Beach. This state is a truly gorgeous place and worth exploring – here are some ideas for a Tasmanian road trip. Editor’s note: Check out some other small Tasmanian towns worth visiting in this post. Looking out at Cradle Mountain in Tasmania. Although the island of Tasmania sometimes gets overlooked, it has one of the most beautiful and unique terrains within Australia. Among the many natural attractions in Tasmania is Cradle Mountain National Park. Located in the Central Highlands region of Tasmania, it’s about a 4 hour drive from Hobart or a 2 hour drive from Launceston. Cradle Mountain National Park is known for its beautiful landscape, plentiful wildlife and walking tracks. Although Cradle Mountain National Park spans 623 mi², visitors flock to see the mountain after which the park is named. The rugged mountain sits overlooking the valley and can be best seen from Dove Lake. Walking tracks through the various terrain are a big attraction for visitors to the park. More than nine thousand people a year walk the Overland Track, a multi-day, 65km trail that spans between Cradle Mountain and Lake St. Claire. For day-trippers, the Dove Lake Track and Marion’s Lookout provide beautiful views of the mountains, rivers, and lakes. Along these tracks are also wonderful opportunities to view animals in their natural habitat. Pademelons, Tasmanian Devils, wombats, platypus and many others call Cradle Mountain their home. Weather at Cradle Mountain can be unpredictable and the area sees more rainy than sunny days. The best times to visit range between December to April during the summer and autumn months. Maria Island in Tasmania is not far from Hobart. Are you looking for a great day trip out of Hobart? 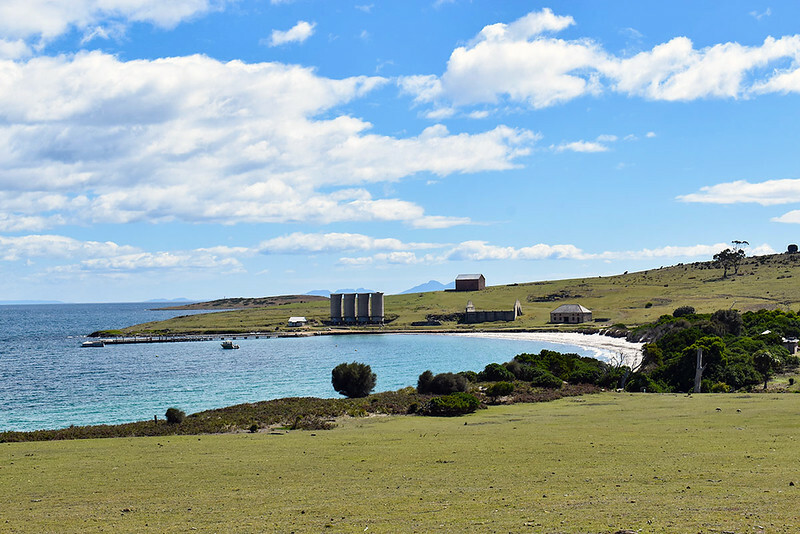 A 2 to 3 hours drive north of Hobart, along the Tasmania East Coast, is the pristine and protected Maria Island. In order to get there, you need to take a 30 min ferry from Triabunna and make your way around the island for a day. It is also possible to camp there and you can hire bicycles to get around. There are no motor vehicles, no shops and only rain water, so you need to be self-sufficient. Maria Island has a mix of convict history and wildlife to keep you busy for the day. On your visit there, you will easily meet kangaroos and friendly wombats, while learning about the island’s role in Australia’s convict history. Maria Island is one of Australia’s 14 convict sites listed on the UNESCO World Heritage List. Some of the buildings are a beautiful testimony of Convict architecture and cast an impressive figure on this somewhat deserted island. After the convict period, a sheep far was set up there and is now a camp site. There are many places you can hike or cycle to, and enjoy a picnic on this beautiful island. Also, don’t miss the beautiful “Painted Cliffs” at Hopground Beach. 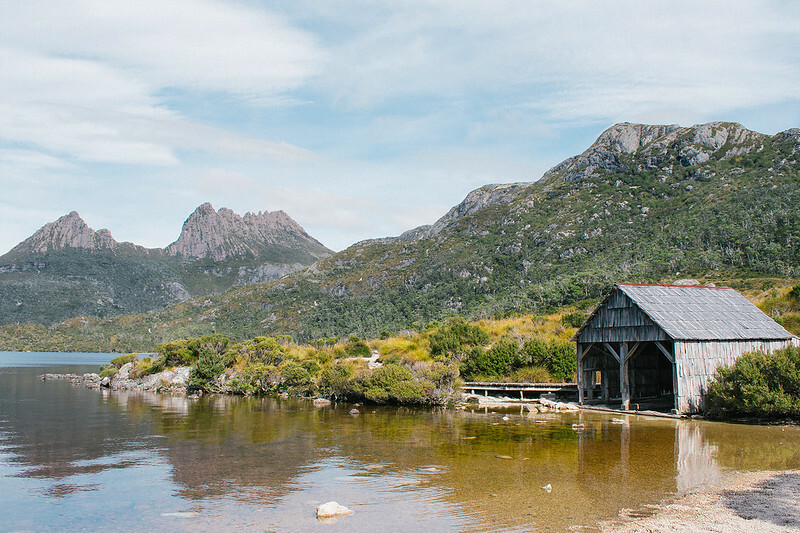 Check out some of the best places to visit in Tasmania here. 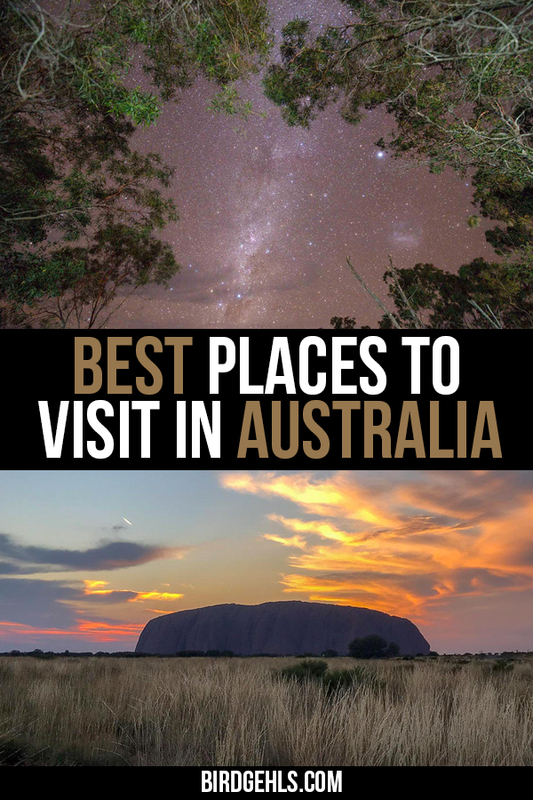 This is just the tip of the iceberg when it comes to the best places to visit in Australia. There are many more places in Oz worth visiting and maybe even some that are yet to be discovered! If you have any places to add to this list, I’d love to hear about it in the comments! For more content on travel around Australia, follow along on Facebook or sign up to my monthly newsletter! Pin this post for future reference! Please note, any prices mentioned are in AUD. All photos are copyright to the author of the accompanying post, unless otherwise stated. Lord Howe Island has been on my list for ages! Except for the fact it is so bloody expensive to get there. A $800ish 2hr flight from Sydney seems painful. But would love to go there one day! Haha yes it’s on my “list of impossible dreams” as well. Maybe one day we’ll both get to see it for ourselves! I really loved your post, even more because my plan for this year is visiting Australia and maybe even to move there in the following years. Melbourne is no1 priority for me, too. Everyone I know that had been there said it is very “European” city and that is why I believe the transition for us would be easier. I didn’t even know it is possible to go coast to coast by train, that is something I will definitely have to try. Oh wow! Let me know if you do make it here this year… hope you do make the move in years to come. Australia is a special place, I say with total bias! Yes it is the most “European” city we have. Sydney is wonderful too, but different. And yes, that’s a dream trip! Thanks. ? This is so perfect! I’m planning a trip to Australia at the end of this year. Even though, I’m dying to see Sydney and Cairns, it still is a fact that I also want to visit Melbourne! Ahh, everything looks so pretty! I’ve never actually heard of any other than Melbourne, Perth and, of course, Tasmania (thanks for that Looney Tunes). Can you actually see Antarctica from Australia?? Are they even close enough for that?! Nah, it’s still heaps faraway! You can head down the bottom and stare out whimsically in its direction, but that’s about it. The Indian Pacific Train looks like the perfect way to explore the country! I haven’t made it to Australia yet, but this sounds like the perfect bucket list. I’m from the US and also trying to explore more of the US (especially west coast) this year – I totally know what you mean about wanting to explore more of your own country. Yeah, it’s hard sometimes, especially with countries as big as ours. Melbourne is my travel goal too. But for me it’s for the sporting events, the grand prix, the Austrian open tennis and the golf. After reading your article I think that Broken Hill sounds quite interesting too. Haha, my BF wants to see the Grand Prix too. Melbs is good for sports. Broken Hill is great, by all accounts – my parents loved it when they visited a couple of years ago. Such a great list! Tasmania’s a funny one – for years I never really thought about it, but recently I’ve been dying to go! Thinking about taking a trip there over the next few months! I LOVED it when I visited – I’ve been hanging out to go ever since. It got really, really neat, whilst the mainland was looking the other way! I wish I could go to Australia today!!! I have to say, my favorites on your list were Tasmania, the idea of seeing Antarctica seemed so cool to me. I also love train rides and would love to ride on the India Pacific train from Sydney to Perth. Three days is a long time, but the scenery looks so majestic. Have fun! The Indian Pacific is a dream trip, for sure! Great tip, thanks Emma! I do have a stack of points, so might look into that. Crazy how much it costs! Broken Hill and Upper Hunter Valley seem to be my ideal destinations. I’m not much interested in cities and country sides and nature getaways are my kinda places!!! Best wishes for you to travel to all these places this year! Thank you! The Hunter Valley has some of the loveliest countryside I’ve ever seen. I shouldn’t read articles like this, it makes me want to pack my bags and hop on the next flight heading there! The Indian Pacific train sounds like something I would love to do. So far I’ve only crossed Switzerland by train, plus a few travels here and there in Europe, and I’ve always loved it! It’s comfortable and the landscapes are always stunning! Broken Hill also looks and sound amazing. It looks like a good place to just charge your batteries for a week! Haha, I apologise! Australia has a pretty diverse landscape, so I reckon the train would be super cool. What an awesome list! I haven’t even heard of the train from Sydney to Perth. I will be looking into that for sure! I have been to the koala hospital and it was a great experience. No cuddles there tho as it’s illegal to cuddle koalas in NSW. I always wanted to hold one and I had a chance to do so in Kuranda, QLD but have thought about it a lot ever since and I think it’s best to not stress the animals with human interactions they might not feel comfortable with. I definitely wish, I hadn’t done it. If you ever make it to the hospital, make sure to support them by buying something from their gift shop. I got a DVD of a documentary of the Koala Hospital and it was a great watch! Good luck on ticking these places off your list! Haha yeah, I wasn’t being literal with the cuddles… Just joking. Thanks for the advice with the hospital, it sounds like they’re doing great things and deserve the support. The train is awesome and there’s also the Ghan, which goes from Darwin to Adelaide, stops at Uluru and is named after “the Afghans”, who helped built Australia’s first railroad. Very informational post! These photos are incredible, LC! Thank you Agness, although admittedly I only took a couple of them! Hi Lydia! The tassie devil is no longer considered a pest and it is illegal to hunt it now. So, it’s the disease that is spreading and wiping out the species – much the same as what is happening to the koala. Both our countries are so big, I think we can be forgiven for not seeing everything in them! I really liked Montreal when I visited and yeah, there’s a lot of similarities between it and Melbourne. They both have a very European feel, although Montreal slightly more! I’ve never been to Australia yet, but hope to make it there some day. Seeing your photos makes me want to get there sooner rather than later. It’s fab, hope you do make it someday soon! Sigh! This would be my wish list too….especially Tasmania. I hope that someday I can do it all and my best wishes to you too. I do hope you manage all of them. Tassie is THE BEST. Thanks for the well-wishes! I would love to visit Australia but I think I would need to move there for a year in order to explore it properly. It is so far away from Europe and I don’t think it’s worth flying there just for a few weeks. For me, I would really love to visit Sydney and its beautiful harbour. I’ve heard there are some really beautiful hikes around it as well. Yeah, I went back for a month when I was living overseas and it definitely didn’t feel like enough time! I’ve lived here for 25 years of my life and there’s still so much more to see – and I consider myself well travelled locally too, haha. These are some great goals! So far i had chance to visit Perth and Melbourne, but i would love to see so much more! Australia is my favourite country! Check out Noosa, Byron bay and Rottnest Island. One of my favourites over there! Great list! I love Australia. Would love to go there and go on a roadtrip. Do you happen to know any great campervan rentals? I haven’t rented one myself here but Maui and Jucy are supposed to be good. Stay well away from Wicked Campervans! This is such a great round up of Aussie destinations! Admittedly, there are some I hadn’t even heard of (as you say Australia is a huge place! ), but they all look spectacular. This list makes me super proud to be a fellow Aussie 🙂 Thanks for sharing! Same! Had no idea about the Tassie rainforest and always forgot that Mt Augustus is so much bigger than Uluru. So much to see, we are very lucky!